around the world | Get Gowing! Travel above your means and within your budget. I had about a 6 hour layover before my next flight to Moscow, so of course I was going to get some view of the city in. Taking the subway from the airport, it took only about 15 minutes to get to the main train station. 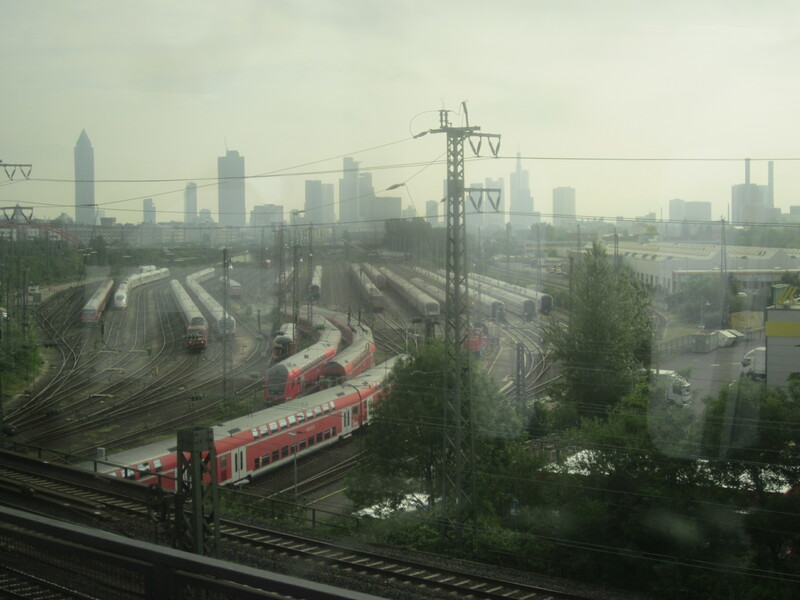 Frankfurt has several trains that service it, but within the city, the underground is called the U-bahn, and the suburban line that is mostly above ground is the S-bahn. 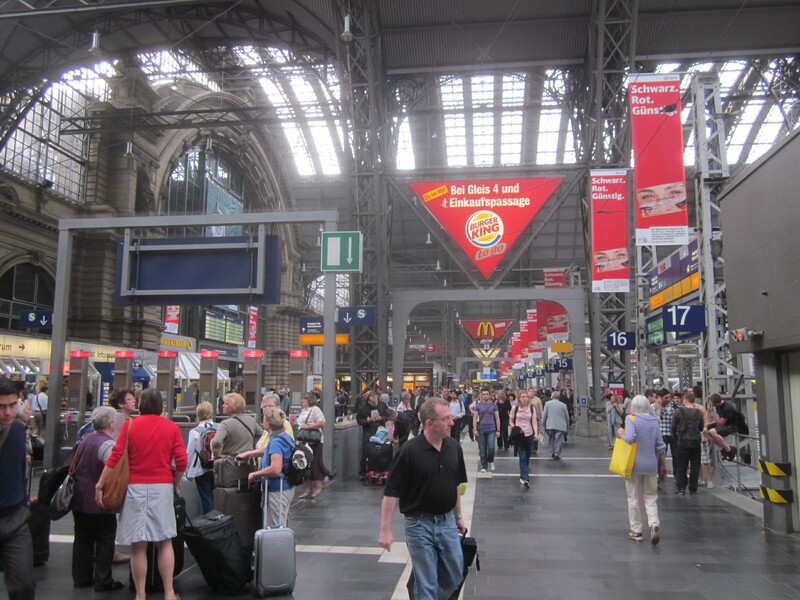 Following Thommy’s (my seatmate on flight ATL-FRA) suggestion, I took a train to the Hauptwache station. I seemingly was able to ride the train for free because I didn’t go through any turnstiles. All I could think back to was my time in Amsterdam when I bought roundtrip tickets and never went through any ticket collecting, in either direction…there was an open area so I just ended up walking around them. 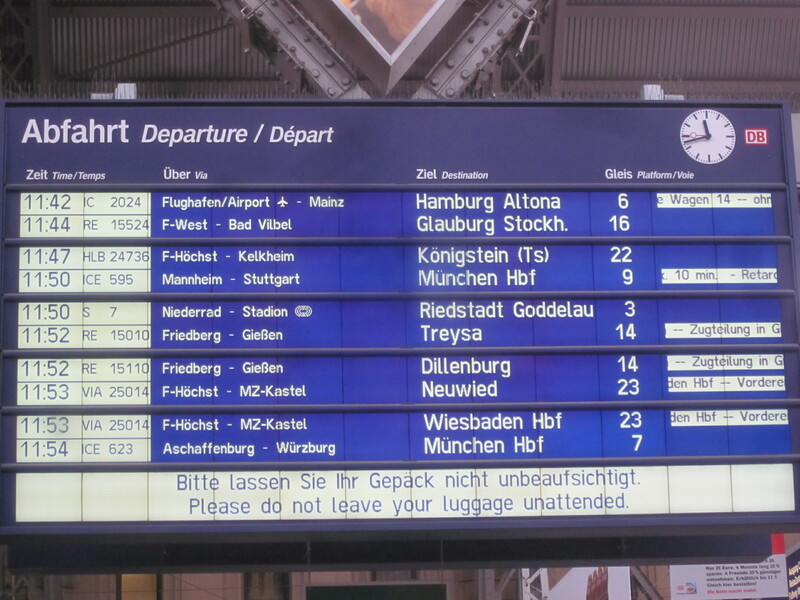 What I read just 5 minutes ago, is that the Frankfurt transit system purposefully doesn’t have any turnstiles. There are plain clothed ticket inspectors that regularly check for tickets. Good thing I didn’t have to go very far, and it was not during rush hour. I didn’t have any knowledge of where I was going or what I was doing, which was kinda nice. Just walk around and meander a bit. 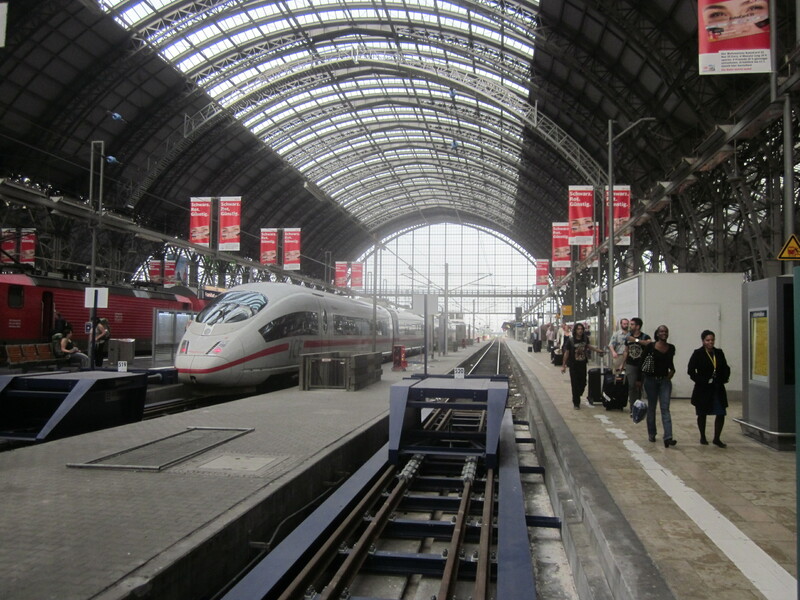 Before I could get to Hauptwache, a transfer was required at Frankfurt Hbf. At Frankfurt Hbf. I'll be taking one of those high-speed trains soon enough. 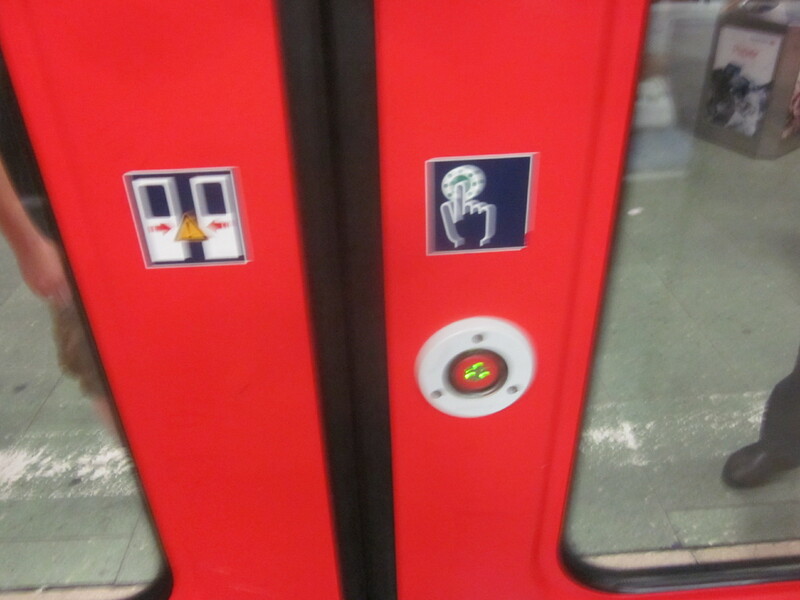 One thing I wasn’t used to, nor had I seen before until Frankfurt, was a button to open the doors of the train. My stop was coming up, and I was looking at something on my iPod, and was just standing next to the doors distracted waiting for them to open. After I looked up for a brief second, I saw the blinking button. About 5 seconds after I left the train, it moved on to the next stop. Pay Attention!! After arriving, I just picked a direction and started walking, for about 20 minutes away from the station, and didn’t find anything interesting ope. It was still around 9am, and apparently most businesses don’t open until 10am. I got this far and it seemed that it was mostly a residential area, so I turned around and walked back to the station. Good thing I did. 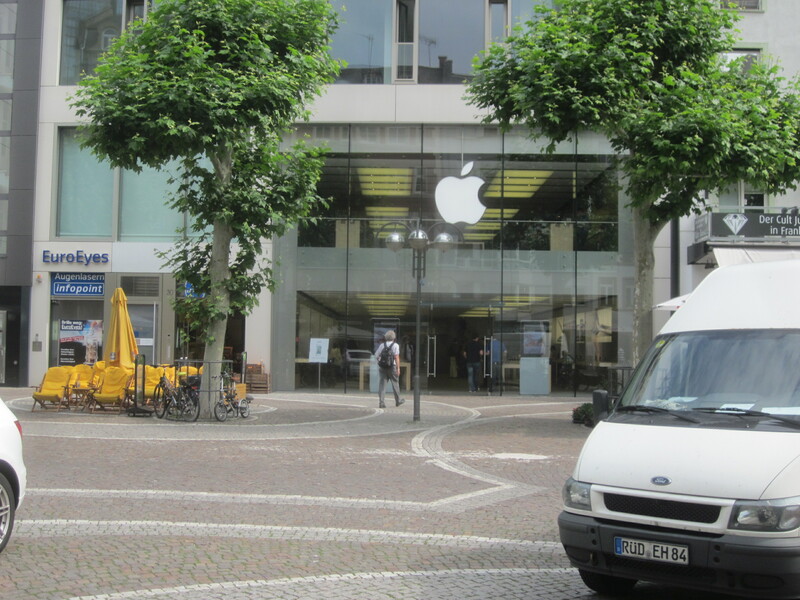 I ran into the Frankfurt Apple store which was on a mostly pedestrian road, Große Bockenheimer Straße. In this area was alot of high end shops and restaurants, reminded me of 5th Avenue in New York. 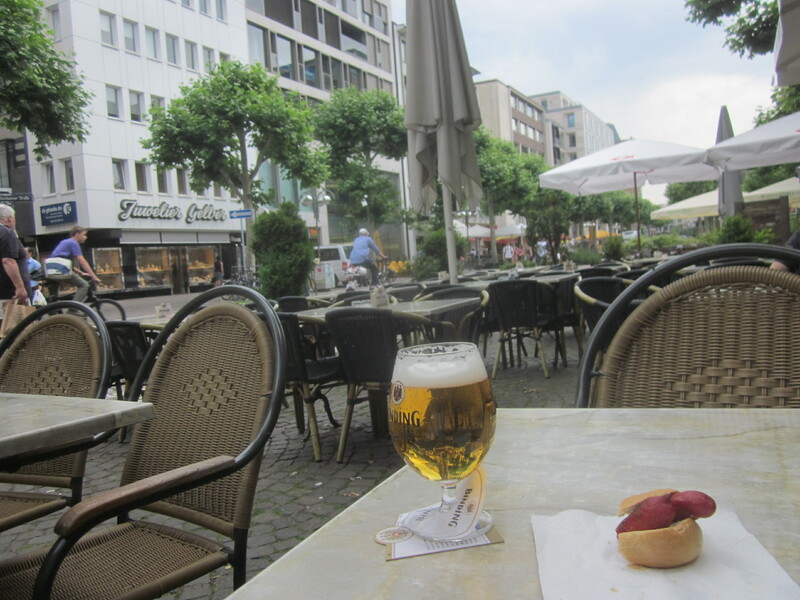 If you’re ever in Frankfurt and into people watching, get a bier und Wurst mit Brötchen (A beer and sausage with a roll) and a table outside. It won’t disappoint you. 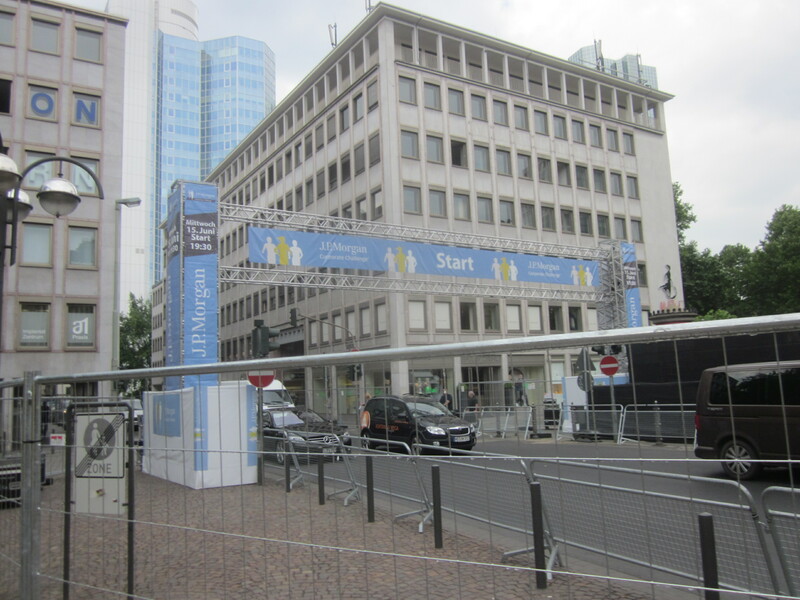 Around Hauptwache was also the start of one of the world's largest running races, the JP Morgan Corporate Challenge Frankfurt, with about 70,000 runners. That was just enough to entice my curiosity. 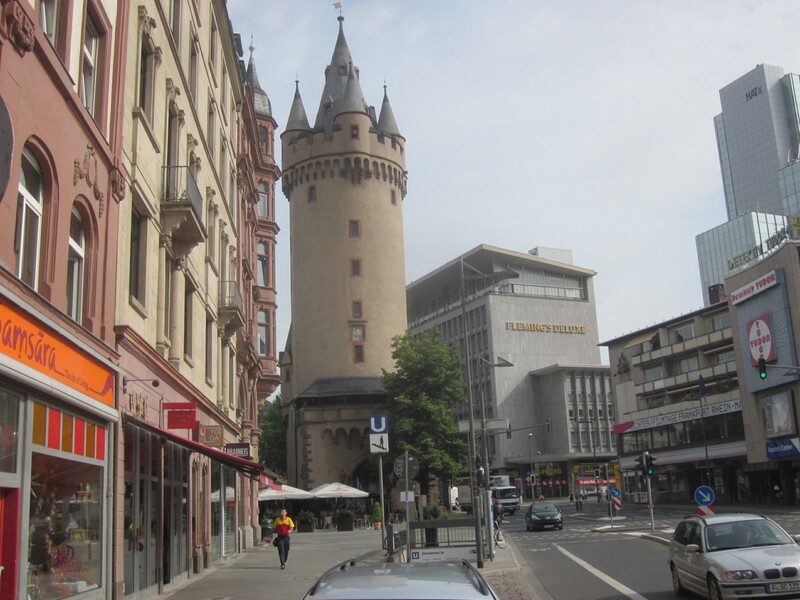 Over the next several weeks, I will have 2 overnight visits to Frankfurt. I can’t wait! If you enjoy these posts, be sure to visit Get Gowing on Facebook and like that page to get all these posts directly to your news feed, as well as MANY MORE pictures of my travels! Just connecting from EWR, so was already checked in. 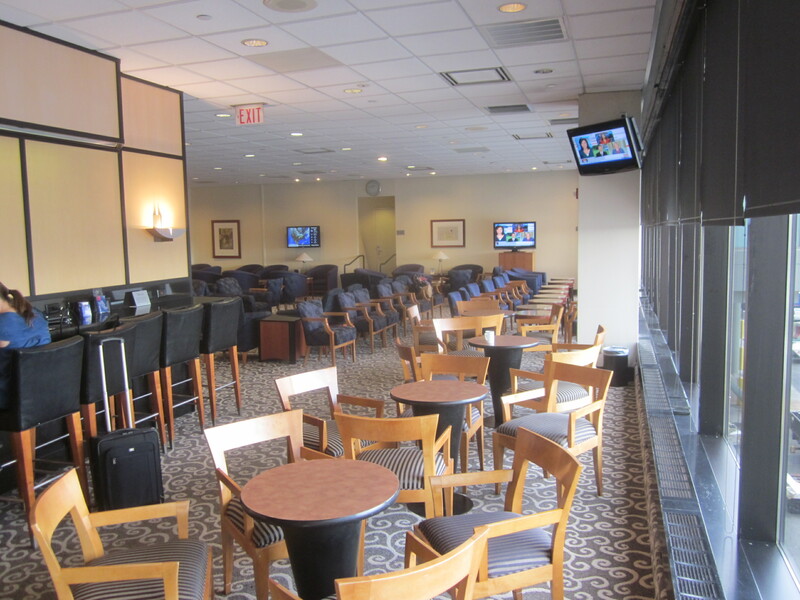 As usual, to take advantage of the current American Express promotion (expiring on June 30, 2011) I did the ATL Delta SkyClub tour. My previous flight was gated at Terminal A, so my order was the 2 lounges in Terminal A, the 1 lounge in Terminal T, the 2 lounges in Terminal B, the 1 lounge in Terminal C, and finally the 2 lounges in Terminal E. Since my gate was in Terminal E, I made the lounge closer to the TGI Fridays my home after my lounge run. 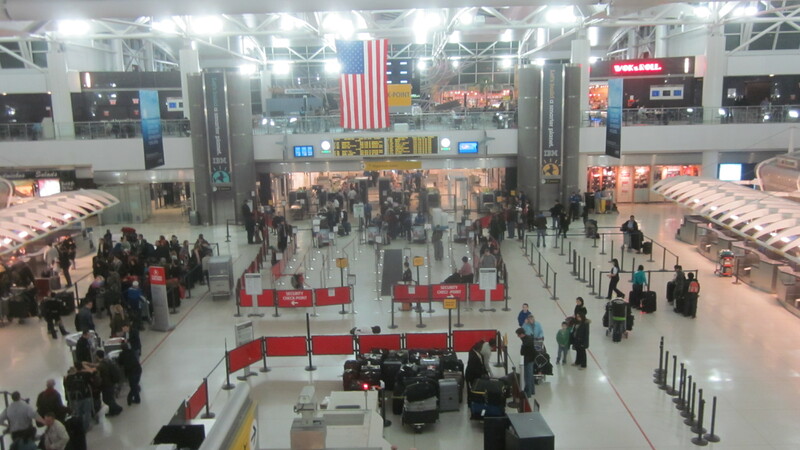 When I was approaching the first Terminal E lounge (closest to Fridays) there was a Delta agent standing there directing all incomers to use the other lounge around the corner. Weird I thought. After checking in to the farther lounge, the agent just gave me a handful of 300 bonus point certificates (which I previously mentioned here)…which is how I ended up with 13 certificates when there are only 8 lounges in Atlanta. Sweet. Free points. Always good. 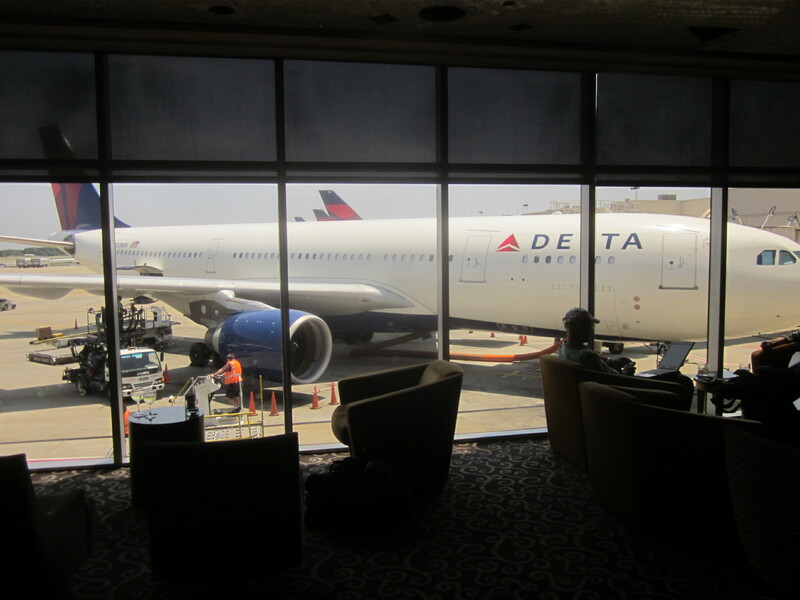 This lounge is mostly one large open room, but it has the best view in ATL if you are interested in looking at a wide-body aircraft up close. The nose of the plane is so close the windows, if they could open, you could almost reach out and touch it. I stayed here for a little bit, had some more Sweetwater 420 Pale Ale, crackers, and cheese, then went to my gate to make sure I was first in line if they needed any volunteers. My gate was E4. The gates are farther apart in the E terminal because this is where most of the international flights board, and so there needs to be more waiting area space for the increased passenger capacities. 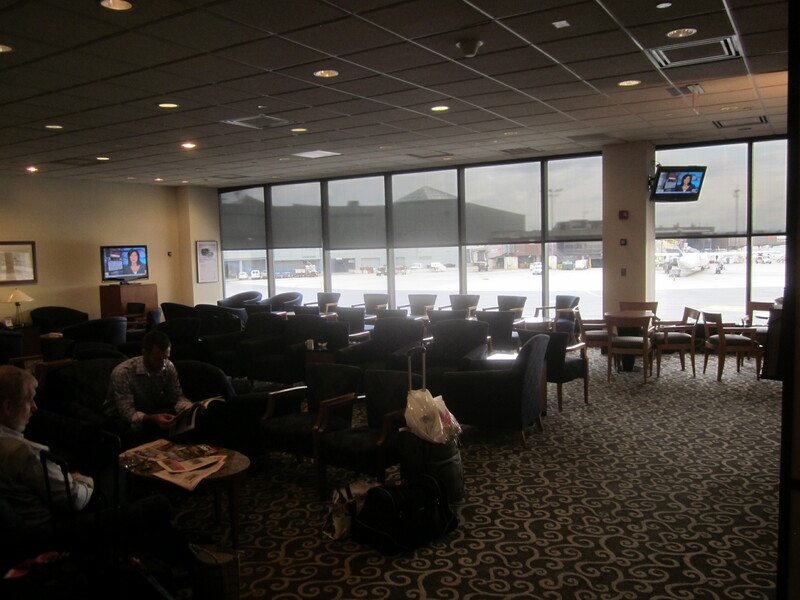 From the farther lounge out to gate E4, it must have taken a good 5-6 minutes. It wouldn’t surprise me if the distance I walked was at least 1/4-1/2 a mile. I thought I would never get there. I arrived about 2 hours before the flight was scheduled to take off, and there was nobody working the gate yet. There were only a few passengers waiting. After about 10 minutes somebody came to start setting up to “open” the flight to gate control. Before coming to the airport, I did some research on available inventory for the flight, and it looked promising, though not guaranteed, that they may need volunteers. She took note and remembered me if she needed anybody. 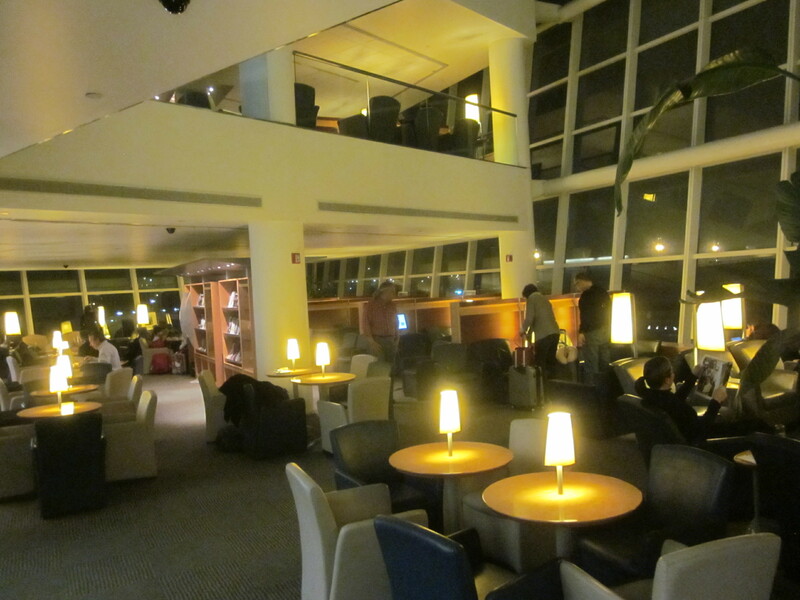 As there was still an hour before boarding, I made my way back to the lounges to wait in comfort….even if it did require another long round trip walk. This time, the closer lounge was available, so I made my final check-in for my last 300 point certificate. Later, I found out from my seatmate on the plane that there was a guy that kinda went a little crazy, or needed some medical assistance, and had to be escorted out. So I assume that’s why they weren’t letting anybody else in temporarily. 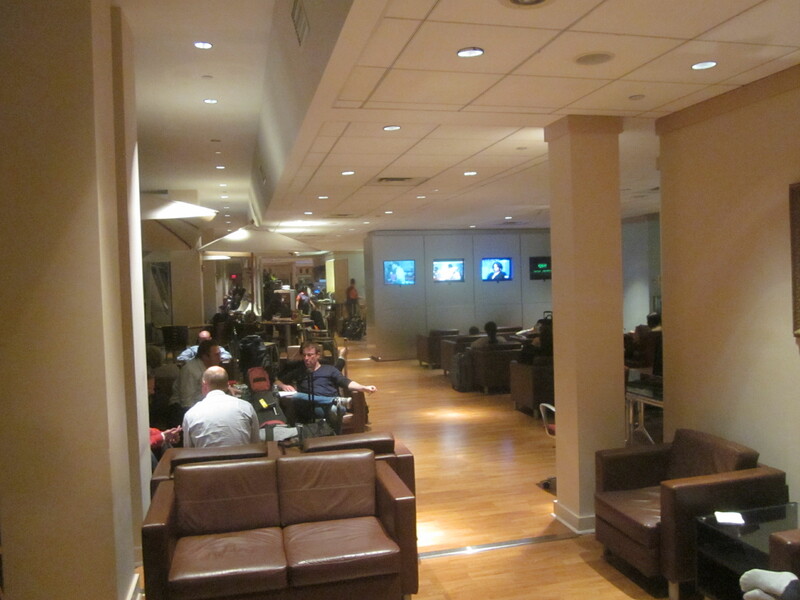 This lounge is a bit smaller that the other E lounge, but it does have showers available. For about 45 minutes I again enjoyed my last Sweetwater 420 PA for a few months. I left the lounge a little early just in case they needed me and they needed time to process everything. Unfortunately, it wasn’t oversold enough to need any volunteers. On this flight I would be getting to try out the new Economy Comfort seats that officially rolled out for purchase June 1st. For a few weeks prior however, they were already installed in some aircraft and able to be used and selected for free by all Medallions. Now, only Platinum and Diamond Medallions can select them for free. Golds get them at 50% off, Silvers at 25% off. And General Members pay full price. The main perks of Economy Comfort are 4″ of extra leg room, 50% more recline, free spirits (beer and wine are already complimentary), and being able to board earlier and not have to fight for overhead space. The legroom difference might not look like much (if you click on each photo, you’ll get a better view of the difference), but its definitely noticeable enough where I don’t have any worry about my knees when the person in front of me fully reclines. I didn’t take my laptop out but I would still be watchful if I had my computer on the tray table and the person starts to recline. The seat may still hit the top of your screen. I thought I took pictures of the differences in recline, but I either lost them or didn’t take them. On my flights home, I have Economy Comfort seats again so I’ll be sure to snap pics then. 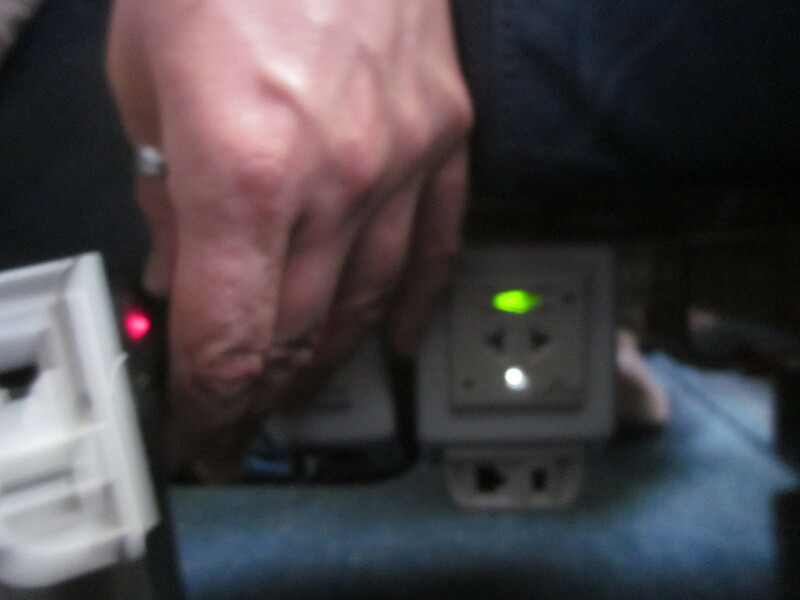 This plane also had power ports (AC & USB) for every seat in Economy Comfort. It seems these seats require a little more oomph when trying to recline versus regular seats. Just don’t be afraid to push a little harder while holding down that silver button. Of course as a courtesy give the person behind you warning when you are reclining. This aircraft has power ports for the entire forward section of economy, not just Economy Comfort. Both ports are located underneath the seats, in the center (at least for the double seating to the outside of the aisles). My seatmate's ports were slightly broken when we found it. Mine was the lighted up one on the right. On this aircraft, economy also has personal entertainment on each seat headrest. Delta is working on reconfiguring their planes so that all their long haul flights have individual in-flight entertainment in economy. In the meantime, you may want to avoid flying their Boeing 747-400s to Asia as they still use projector screens for economy. Service started a little later than expected, since there was some rough wind. 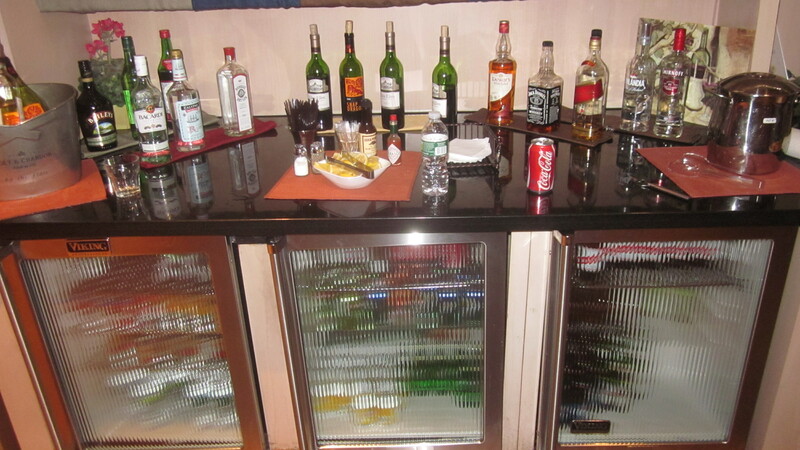 Nothing special, standard service….drinks first, then the choice of meal. I chose the chicken with some mashed potatoes. I forget what the other meal was. 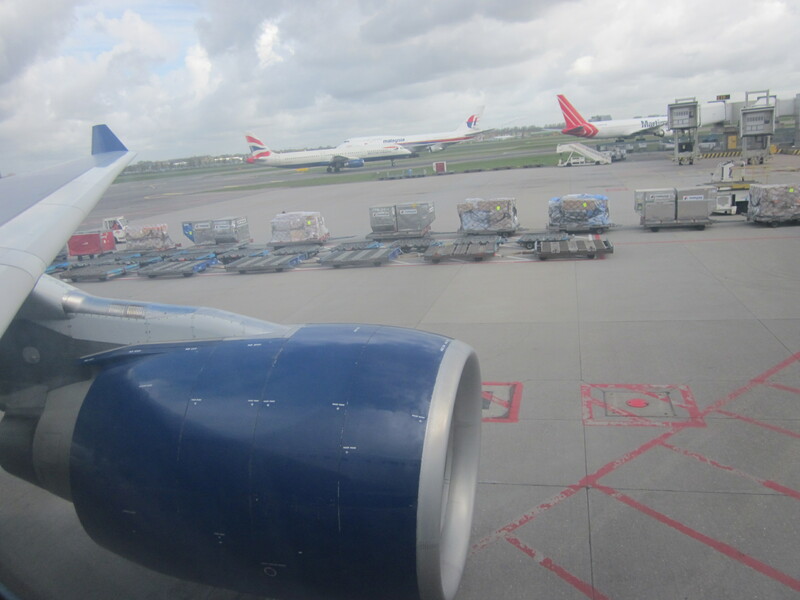 As most eastbound flights to Europe are red-eyes, service slowed to allow for sleep soon after dinner. I would have appreciated a refill on my red wine, but I suppose I should have used the call button if I really wanted it. Getting off the plane was fairly quick, though I took my time a bit. Thommy were still engaged in conversation all the way through from when we woke up all the way to when the jetbridge pulled up. Even though I took a few extra minutes getting off the plane, he waited just after the jetway for me. 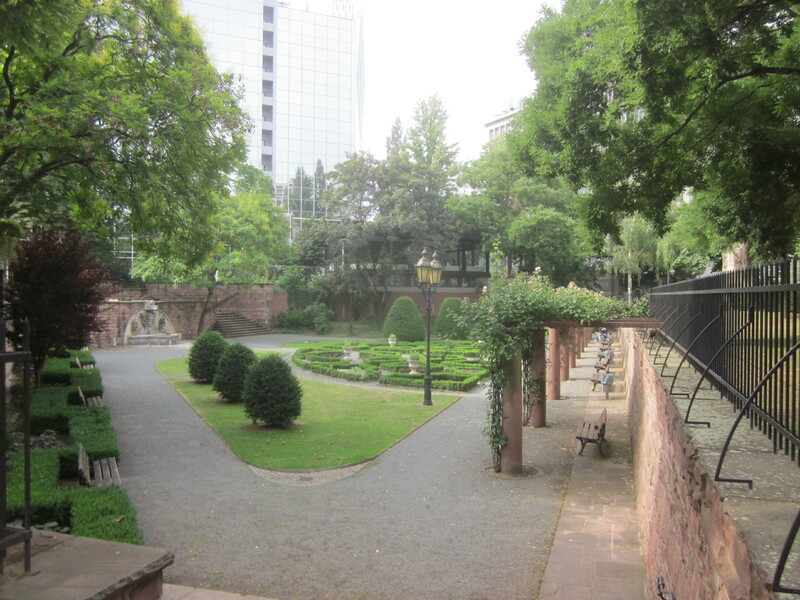 We continued to talk and he gave me suggestions on where I should go in Frankfurt for my 6 hour layover. Once we got to immigration, we separated into our respective EU / non-EU passport lines. Similar to Amsterdam, you do not need to fill out a landing card when flying into Frankfurt. I got my stamp, and was funneled into the baggage claim area. I went to an agent to make sure my bag was on this flight and not stranded in Atlanta somewhere, then I was off to explore Frankfurt! Go to Get Gowing on Facebook to see more photos on this segment of my trip. 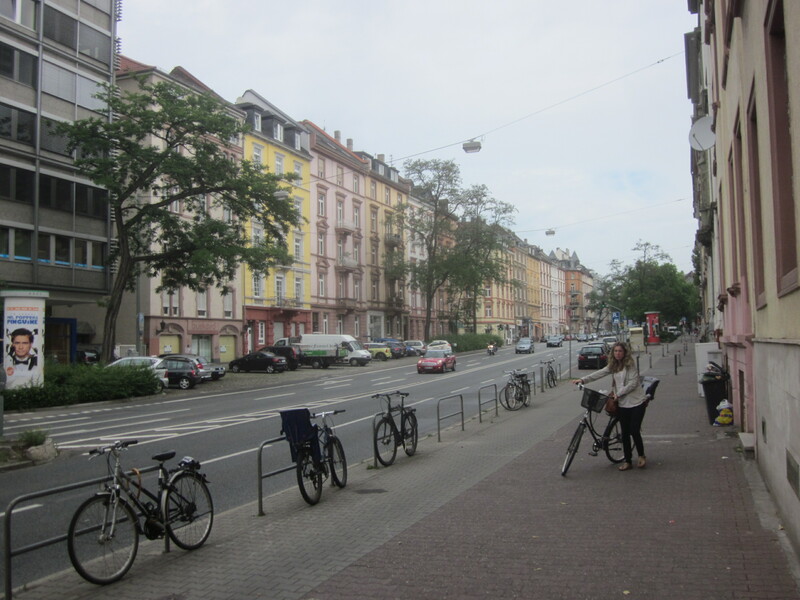 This is my first installment in a multi part series about my summer trip through various cities in Germany, Japan, Switzerland, Austria, and the Netherlands. I have never encountered much of a wait whenever checking in at Newark. Today was no different. Plenty of agents and not that many people. 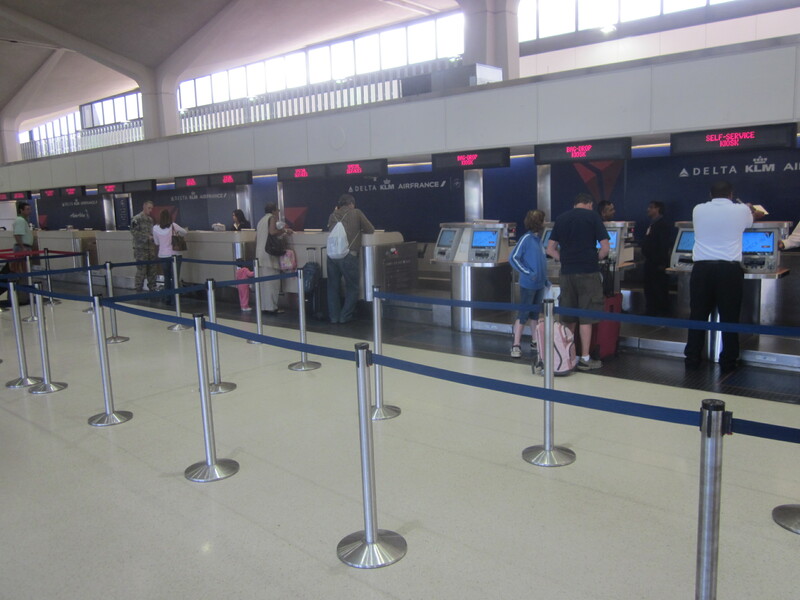 When I got there, the Sky Priority line had nobody in it (I took the picture after I checked my bags). Again as I had my backpack checked, I checked the luggage tag since I knew there were several connections (EWR-ATL-FRA-SVO-NRT) the tag could be printed incorrectly and my bag could end up somewhere else. Not that this would be a problem since I took out that insurance policy, but still, a good practice. I think with that many connections, the agent needs to manually make a bag tag instead of it being automatic with the computer, not quite sure. Just took a couple extra minutes then I was on my way to the lounge. On this flight, because of the debacle that 14 active Army soldiers went through because of Delta (see THIS video) and that I wanted to support our troops (not to mention it was Flag Day), I was going to trade my upgraded First Class seat to anybody I saw in uniform that was on active orders. I had plenty of time in Atlanta, so I wasn’t in a rush to get to my next flight. All I had to do was lounge hop to collect my American Express Membership Rewards 300 point bonus certificates which takes about an hour, and I had more than 3 at the airport. Luckily I did find somebody who was on orders flying on my same flight. You can see his back at the counter on the Sky Priority picture above. I was even willing to guest him and his fiance into the lounge with me. He didn’t want to accept the offer. Not sure why, but he didn’t seem interested. I guess he felt uncomfortable? I mean, I guess its a little weird having a stranger come up to you and offering to trade a first class seat for an economy seat…AND getting into the lounge. (Though I’m not even sure if he knew what’s inside the lounge). Oh well. Maybe he’ll change his mind at the gate. 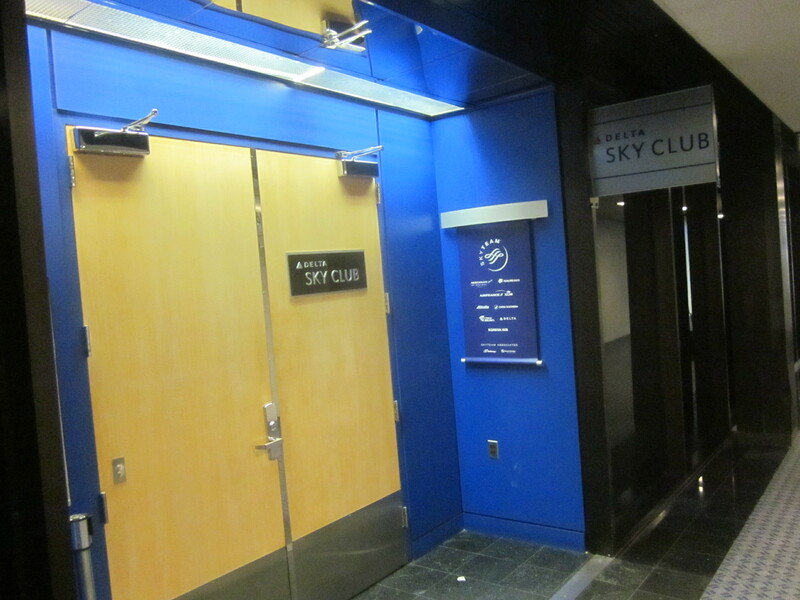 Newark Delta Sky Club. Its a small lounge, but it has everything I need. Fast internet, snacks (unfortunately, most Delta SkyClubs don’t stock any hot food choices), nicely stocked bar with a couple beers on tap, plenty of outlets, and out of all my visits I have yet to see the place so packed that I couldn’t find a seat. It was less than a quarter full when I was there. Of course I got a 300 point American Express certificate for checking in with my American Express Platinum card. Entrance is between security and all the Delta gates. GREAT view of other gates and the runway. One notable thing happened while in the lounge. As I was walking in, there were 2 delivery men bringing several cases of Heineken into the lounge. After checking-in, I end up having a conversation with the older delivery man (probably early 50s) as he was taking a coffee break before his last delivery stop. We probably had a 10-15 minute conversation about traveling and how one time he got to travel in business class for free to Hawaii because a friend used to work for Continental. I later tell him that I was going to Japan, and he was amazed. That he would love to go see Japan one day and that its been a dream of his to go. It didn’t even phase me when I said “Japan”. Just 3 years ago, if somebody asked me where I was going and I said some far international destination, inside I felt awesome….special. Like it was a once in a lifetime opportunity to visit _______ , and I was about to do it. Now, in just a couple years, a list of far destinations can roll off my tongue like I’m just getting in my car and going down the New Jersey Turnpike. His conversation brought me back in check with reality. When I got there, they were already boarding Zone 2. 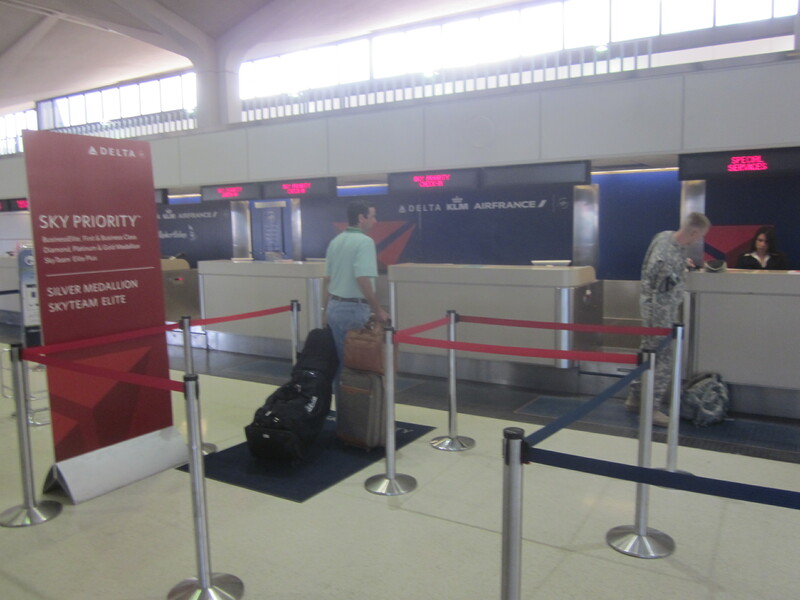 (The order of boarding with Delta is usually passengers that need assistance & those traveling with small children, the premium cabin, then Zones 1 through 4) I again saw the soldier in queue to board, and gave him the same offer, to change seats when we get on the plane. He again declined. Oh well. I tried. I walked ahead to the front through the priority boarding lane and got on the plane. Just after the boarding pass scanners at the top of the jetway, there were two TSA agents waiting and just as I passed, the next girl in line was asked to do a “random screening” prior to boarding. I haven’t seen this before, especially without any real set up. Just two agents standing there, no table, no nothing. The first class cabin was full, and I was the last one to take my seat. 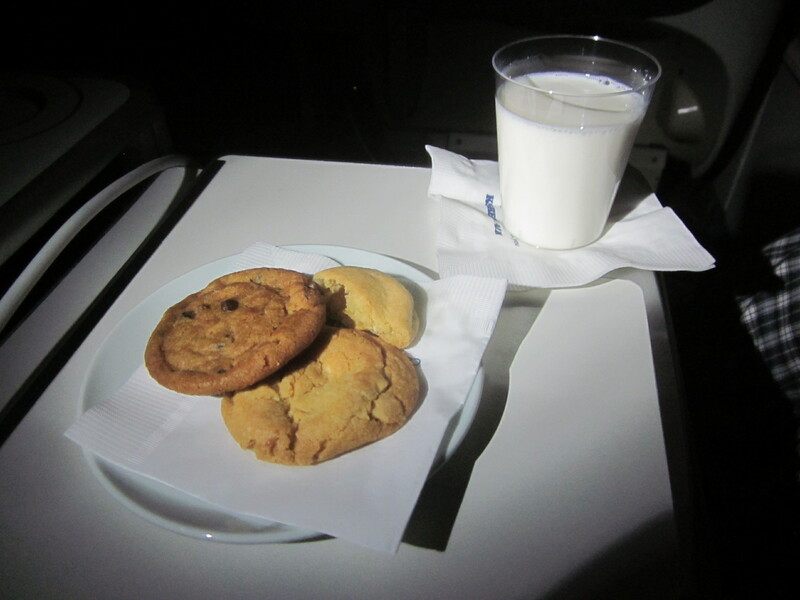 Within 3 minutes, I was greeted by the stewardess and offered a drink. I chose OJ. 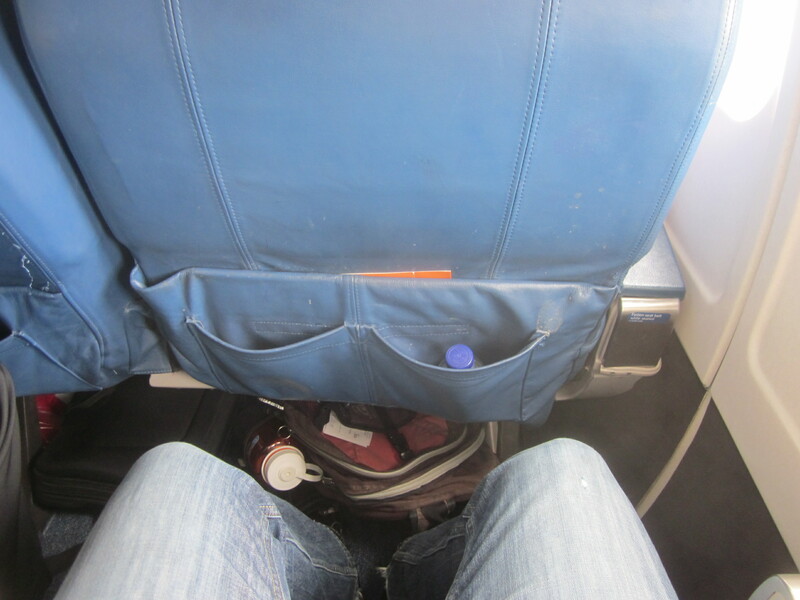 On Delta, there is usually a small bottle of Dasani waiting for you at your seat. I’m not sure why, but we pushed back a few minutes late. The captain said he would do what he could to make up the time in the air. This was a standard domestic first class seat. Had no AC or USB power outlets, or personal entertainment systems, but it was only a 2 hour flight. I could deal without those. And Delta still provides a mini pillow and a small blanket in First Class. Though I usually just stick them in the overhead since most of my domestic flights are less than 2.5 hours. 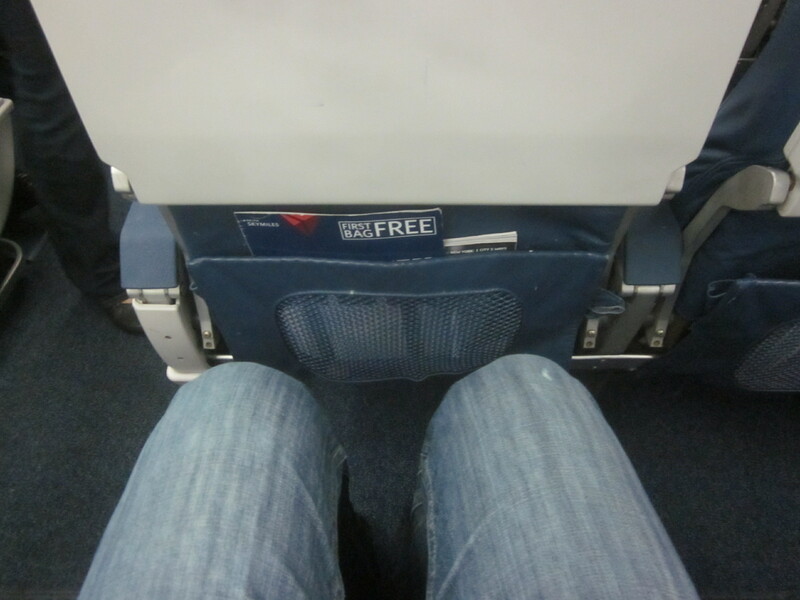 Plenty of knee and leg room, at least for a 2 hour flight. 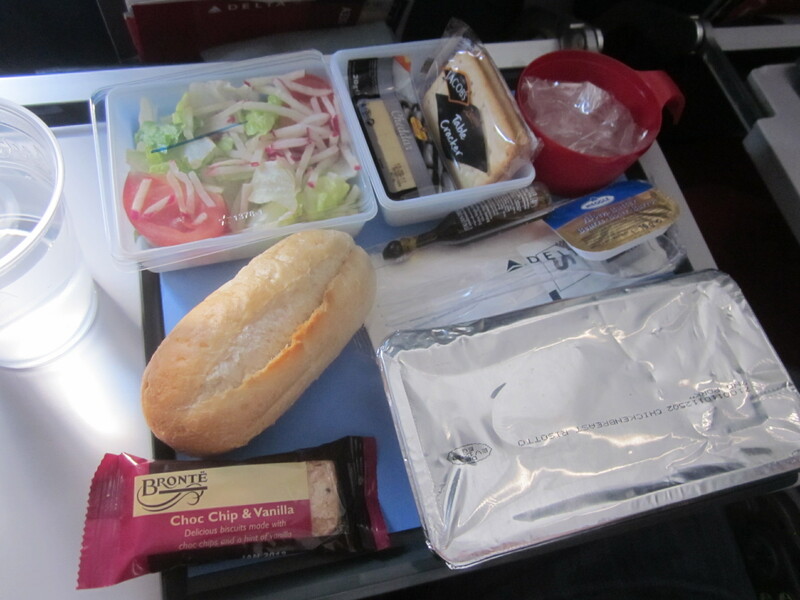 Even though this flight is under the minimum mileage for serving a meal in First Class, they still do so because their competition (Continental) on this same route offers their First Class passengers meals still. But Delta only offers it when the flights occur at meal time. I know that a few flights that leave in the early afternoon only get a snack basket passed around to pick from. We only had one meal choice, which was a chicken sandwich and a bowl of fresh fruit. I’ve never had a Bloody Mary before, so I figured why not try one when I don’t have to pay extra for it? 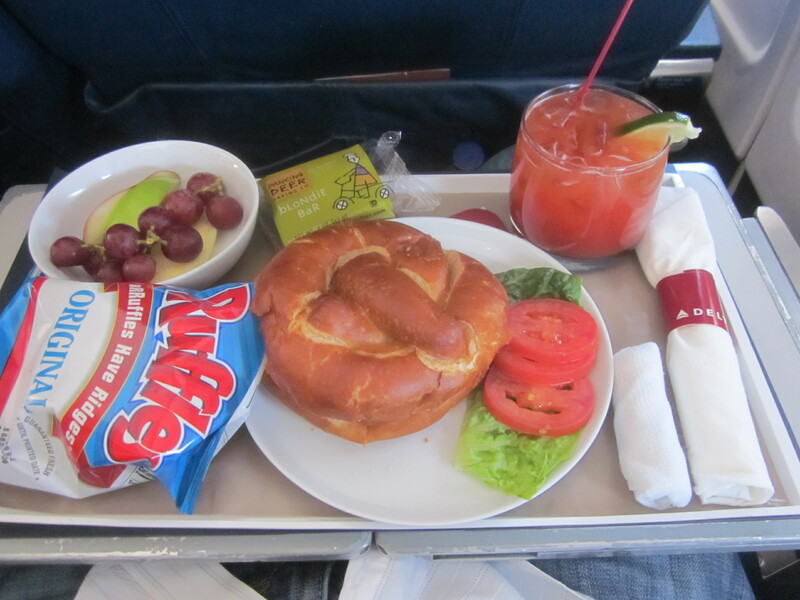 I’m not sure if this was just a bad mix, or because I was 35,000 feet up, but I don’t think I’ll ever get a Bloody Mary again. It was difficult for me to finish it, but I felt bad sending a full drink back. After a quick nap, I woke up to our initial approach to Atlanta. There weren’t any problems when we arrived in ATL. No long wait for a gate, no wait for a jetway operator. Since I was in the last row of First Class, my seatmate even held up traffic so I could get my bag and deplane. How nice of him. We arrived in Terminal A and I was ready to begin my tour of all 8 Atlanta Skyclubs to rake in the American Express points. Wow. I didn’t realize how much I have to write still, and I’m already about to leave for my next big trip! At least this next trip is not exactly all vacation, so I will have more time to catch up on these previous entries, in addition to what is currently happening wherever I am. This upcoming trip is primarily rehearsing and performing with the Aimachi Marching Band based out of Nagoya, Japan. We are performing in exhibition at the Basel Tattoo in Basel, Switzerland (just change the language to English about halfway down) in mid-July. Afterwards, for about a week, I will be roaming around that area of Europe before I head back to the US to do some consulting in Alabama. Hopefully I can make the trip to Indianapolis right after that work out. Quite a busy summer. I can’t wait! By the way, even though I do it all the time, I still absolutely loathe packing. Originally, from here to the end (Asian portion of this trip) was the only trip I was taking. London and Amsterdam was a last minute add-on. I managed to work out getting all these flights for only 120,000 Delta Skymiles, booking everything in business class over three airlines, none of them being Delta. It took about 4-5 hours of research on my own, then about another 3 hours on the phone with a few Delta agents getting everything ticketed. Most people would agonize over such a task, but I’m an airline geek. And I’m estimating that if I paid for a similar itinerary (too complex to actually ticket, so I can only speculate), it would be somewhere in the $7,500-$10,000 range. For me, its worth it. 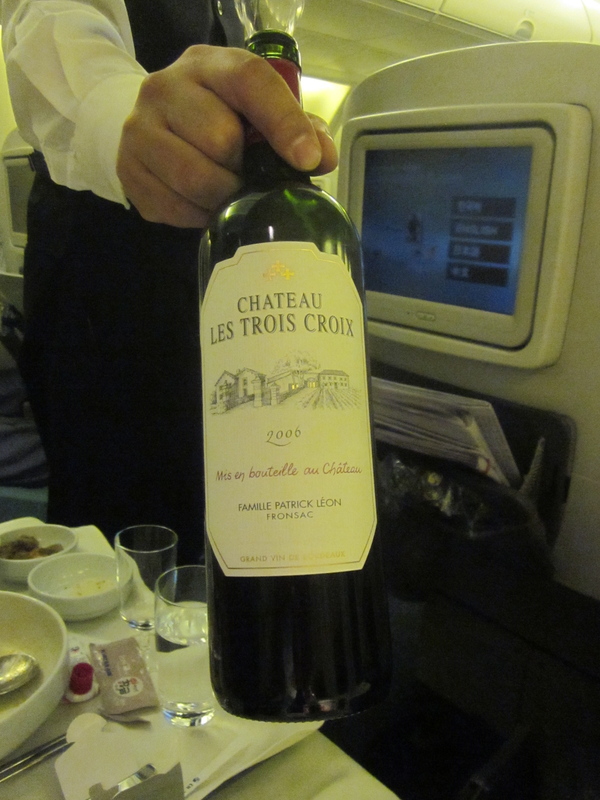 Korean Air has separate dedicated lines for First Class and Prestige Class (what they call their business class). 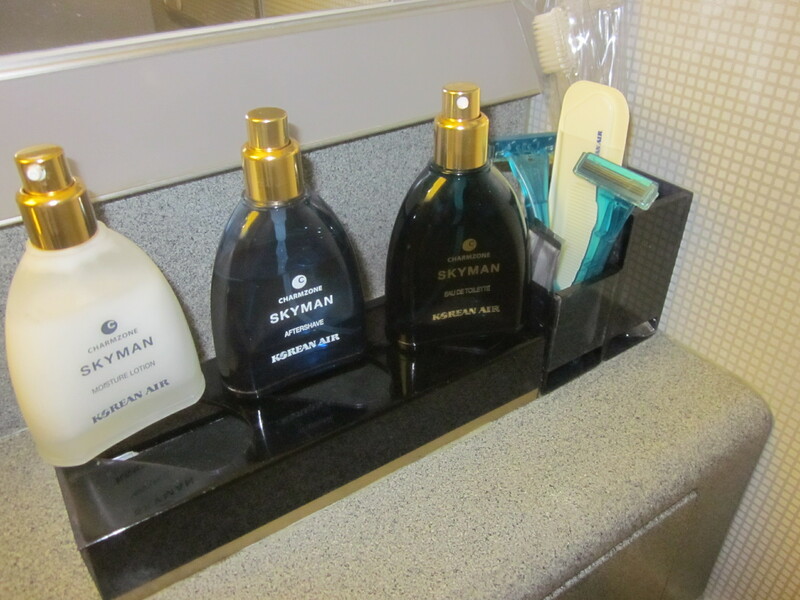 Also allowed in the Prestige line are the Skyteam Elite Plus, Skyteam Elite, and their own Elites. 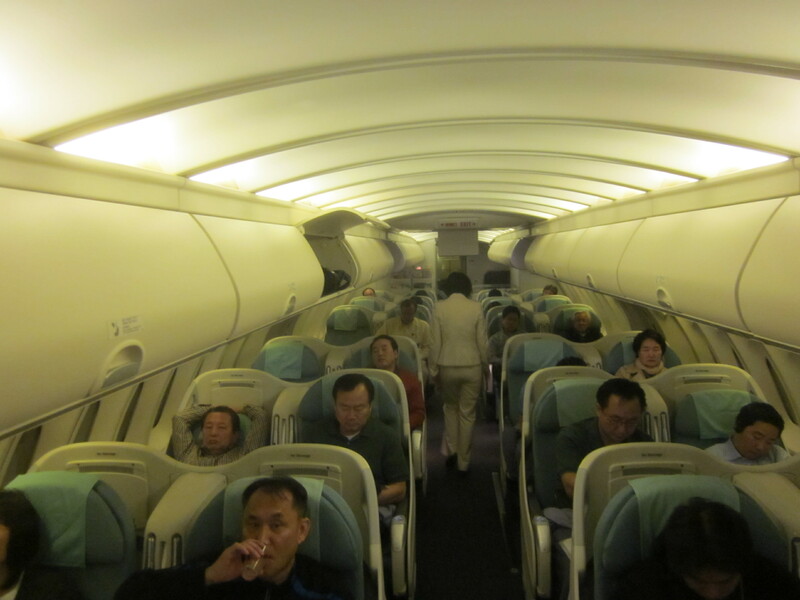 I believe the Korean Air Million Milers get to use the First Class line, but I may be mistaken. 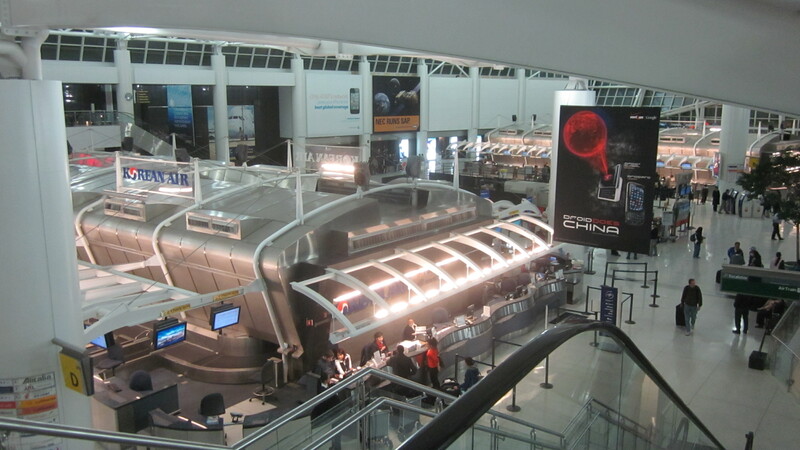 When I got there, nobody was in line so I just walked up to the first agent, which was the First Class line. My first final destination was Bangkok (BKK), but I was traveling ICN-CAN-BKK (Seoul/Incheon – Guangzhou – Bangkok) with ICN-CAN-BKK on China Southern Airlines. In the process of checking in, I was told that she could only give me my first two boarding passes. When I get to Guangzhou, I would need to get my last boarding pass at the China Southern transit desk. Ok, not a big deal. My luggage however could be checked all the way through to BKK. Travel Tip: Always check the luggage tag that the airline prints out for you. 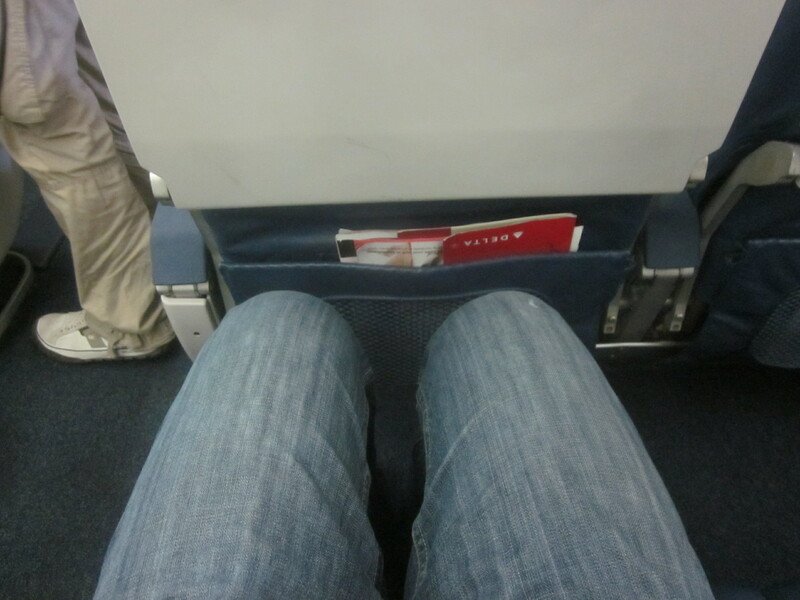 Especially for this leg, I was connecting twice, and traveling on two different airlines. While I haven’t personally ever had that tag print incorrectly, I’ve heard stories where it has. Check to make sure that ALL your flights/connections are on there in the correct order, and the flight numbers are correct. Only takes 10 extra seconds. 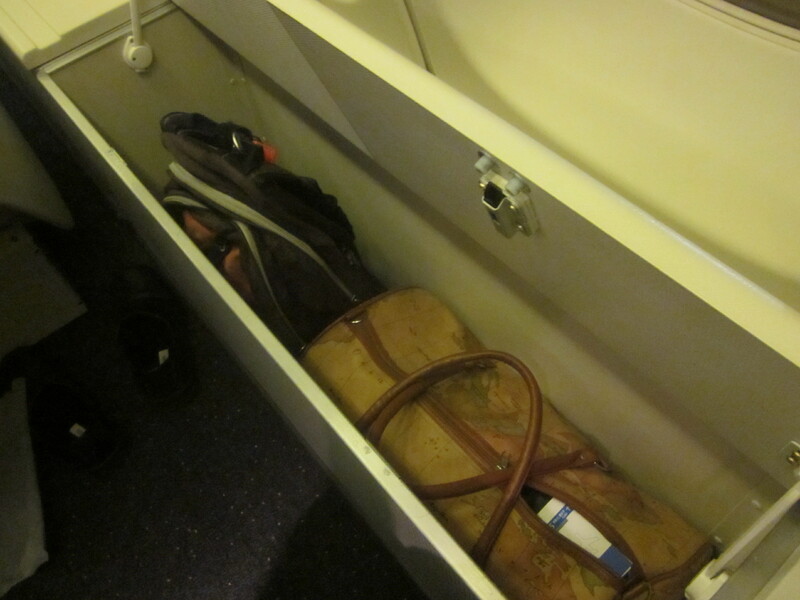 If your bag isn’t on the belt at your destination, you wouldn’t want it to be something that you could have prevented. I was at the desk for at most 5 minutes, grabbed all my documents, and then headed off to do my tour of 3 lounges in JFK. I previously wrote about my lounge surfing experience. Read it HERE. Until this point in my life, I was mostly an economy flyer. But after recently (Nov 2010) moving up to Gold Medallion, I have seen more upgrades to First Class compared to when I was a Silver Medallion. Even still, when I have confirmed seat in First Class, all my domestic flights only have one jetway to board the plane. But all the big birds flying over a pond usually have TWO jetways. Ok, 1 boarding door and 1 jetway that then splits off to First/Prestige & Economy cabins. I have only made a left turn in the jetway on one other trip (again on miles). 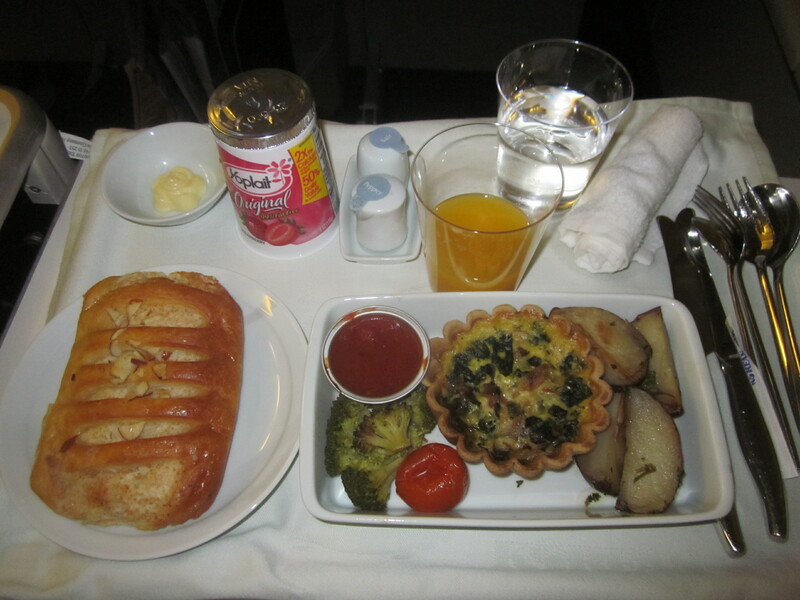 A year previous when I was flying from Nagoya, Japan – Shanghai, China when I performed for the 2010 Shanghai World Expo. I still giggle on the inside like a schoolgirl who just had her first conversation with her first crush when making that left turn. 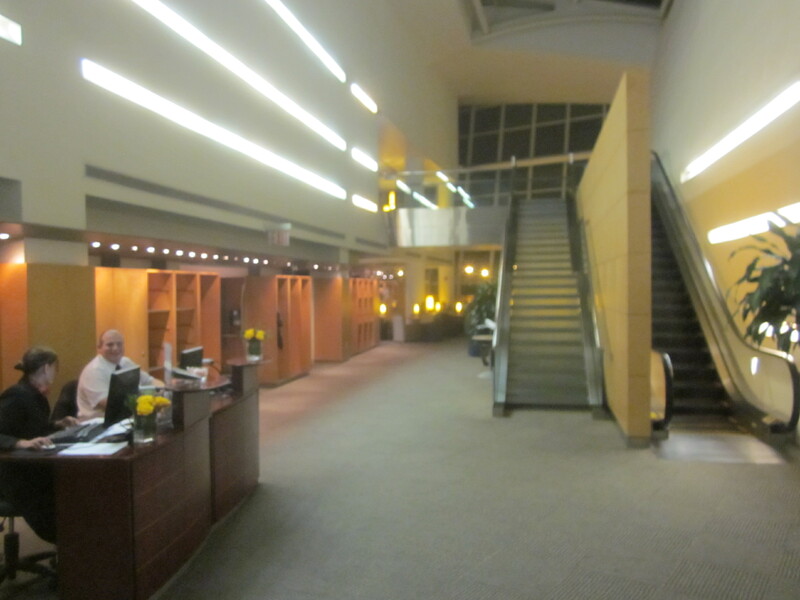 I was greeted as soon as I entered, and was shown the way to the staircase to head upstairs to my seat. 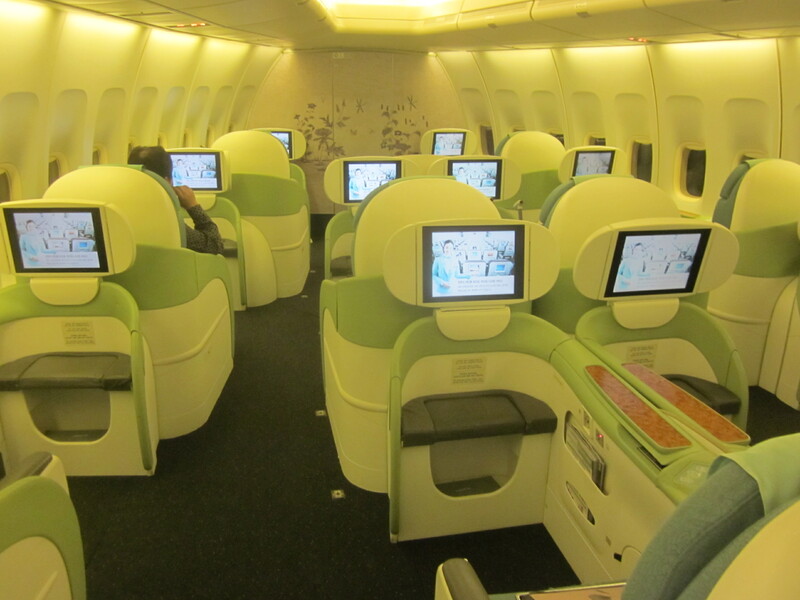 The upstairs of a Korean Air Boeing 747-400 is configured for 24 Prestige class seats. 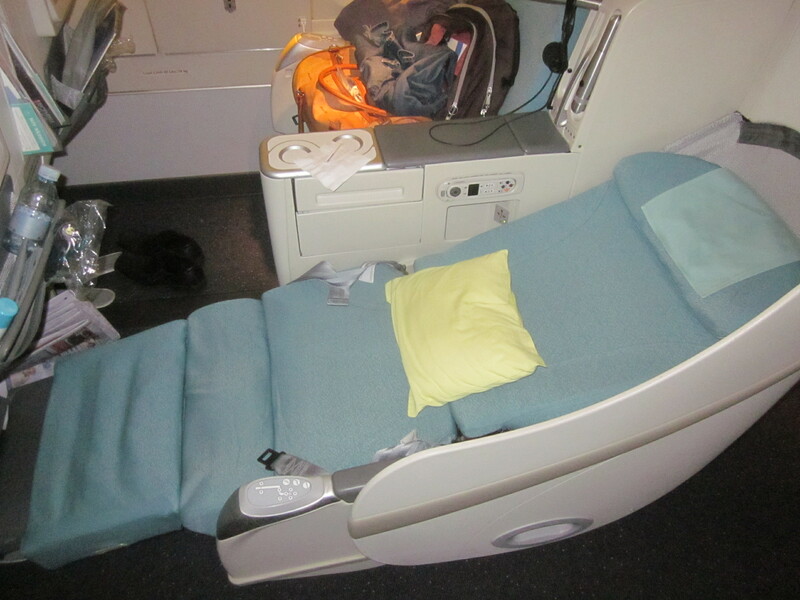 Korean Air is in the middle of renovating their fleet with improved seats in all 3 of their classes. The new business class seat, the Prestige Sleeper Seat, which unfolds out into a 180º flat bed, unfortunately was not on this flight. This plane was equipped with their Prestige Plus Seat, which is pretty much a really fancy recliner seat. In the sleep position the seat is almost flat, and still at an angle. While I thought being almost stretched out like that would be comfortable, it was actually uncomfortable. I am a side sleeper, and its just enough where I think I may be able to turn on my side, only to keep finding out that it doesn’t work. And you do tend to slide down a bit. I heard using the seat belt as like a harness for your rear to keep you from sliding can work. But I didn’t have any luck trying to get that to work. 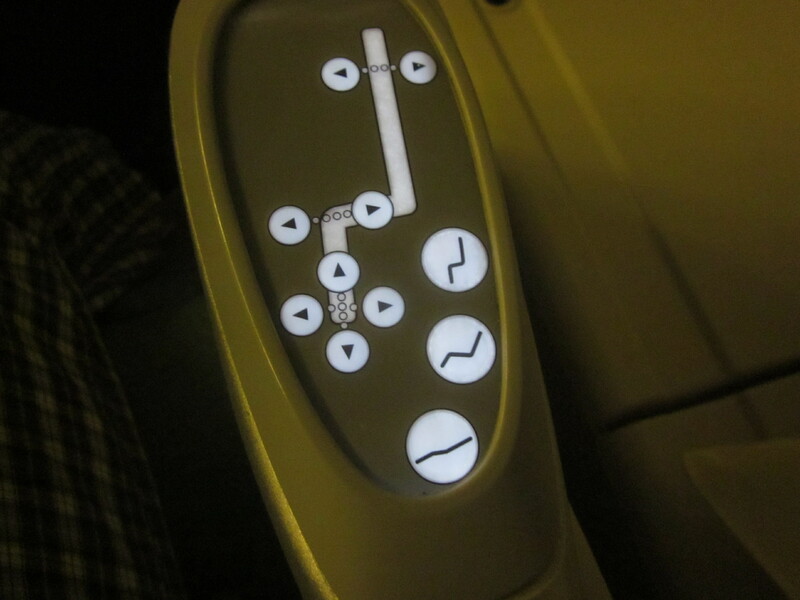 It was actually an easier time sleeping with the seat in the recline position. My window seat was on the “passenger” side of the plane. One cool aspect that the upstairs cabin has which the downstairs Prestige cabin doesn’t have is the under-window storage bins. My backpack and world bag in the space. There was still enough space for another backpack and duffel. These bins are huge! If the other person doesn’t need to put anything in there and I have the entire storage space to myself (which I did), its big enough to not have to put anything in overhead storage. Though it wouldn’t fit many roll-aboard bags. When closed, it also can double as more table space if you need to spread out while working. So unless I had to use the toilet, I could stand, stretch, and get anything I needed from my bags without disturbing my seatmate….and this wasn’t an exit row/bulkhead seat! I may have just screwed myself for life, since ignorance is bliss. However, there were a couple negatives to the seat. It’s a little awkward on these Prestige Plus seats with the heights of the armrests. On the non-shared armrest, it’s a little narrow, maybe 2-3″ wide and at the end are the controls to the seat. The opposite is the center console which stores the tray table, remote control for the in-flight entertainment, USB power, AC power, and little niche for storage next to the power ports. The center shared armrest is a few inches higher than the other, making it slightly awkward when just sitting watching a movie. In the sleep position the seat is almost flat, and still at an angle. While I thought being almost stretched out like that would be comfortable; it was actually uncomfortable. I am a side sleeper, and it’s just enough where I think I may be able to turn on my side, only to keep finding out that it doesn’t work. AND at that angle you do tend to slide down the seat a bit. I heard using the seat belt like a harness for your bum can work to keep you from sliding. But I didn’t have any luck trying to get that to work. It was actually an easier time sleeping with the seat in the recline position (as opposed to sleep position) with the ottoman as high up as it goes. Each Prestige passenger gets a pair of slippers, a small bag for the slippers, and a set of cheap headphones, all of which you can keep. Compared to other business classes, these amenities are greatly lacking. Delta gives out Bose noise-cancelling headphones to their international BusinessElite passengers (though you definitely can’t keep those). No lotions, no eyemasks. The bathrooms were equipped with those little amenities if I wanted to use them. 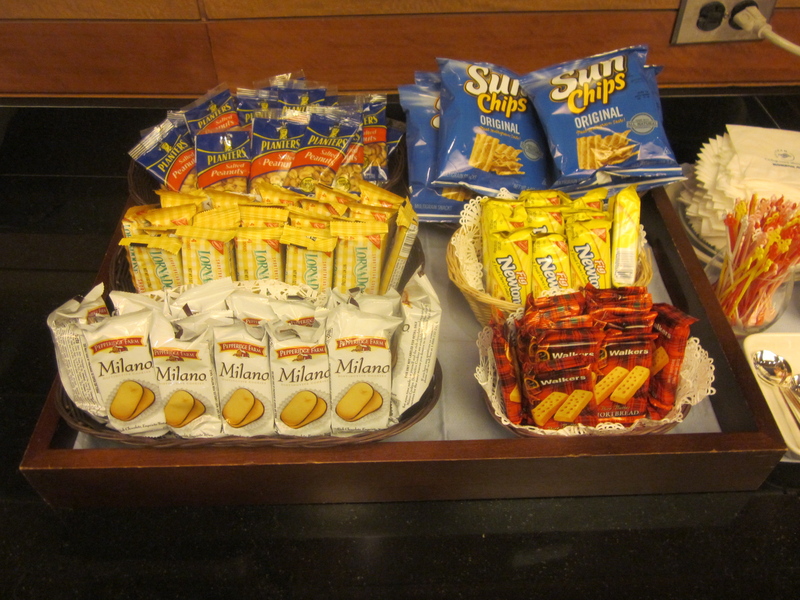 But where they lack in amenity packs, they certainly make up in top notch service. As soon as I got to my seat, I started putting away my things, and about 2 minutes later, the stewardess came by with our pre-flight drinks / snack. Pre-flight offerings. I'd rather have a mimosa, but these'll have to do. This was a red-eye flight (Or red-eye departure. 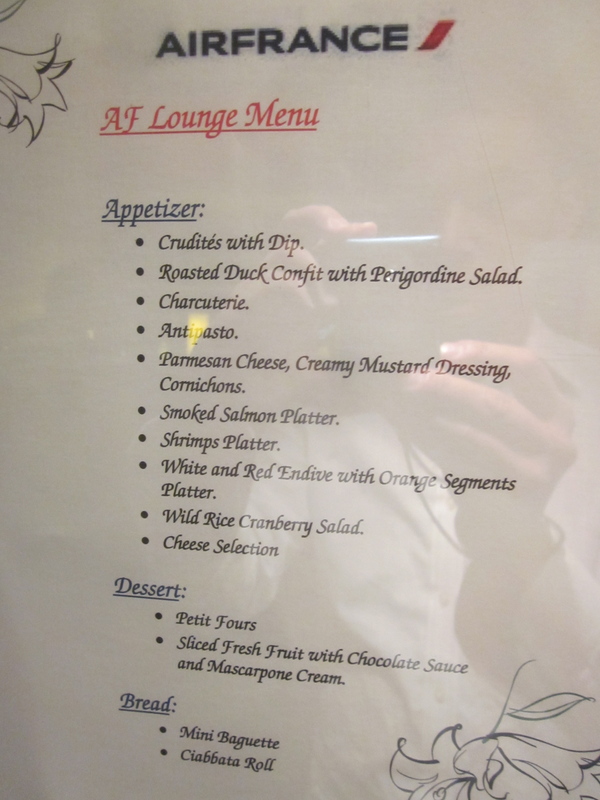 I think its impossible to go between NY & Asia, and not pass the time you should be sleeping either at your origin or destination), so the meal was sort of an abbreviated service. Starts with the hot towels, then a plate of nuts, then the meal on a tray, but with real bowls and plates instead of the disposable things that economy gets. Usually you get your drink and nuts at the same time, then a few minutes later your appetizer course, then the main course. I think they expedite it a little bit so that people can get to sleep a little earlier. I didn’t have any other experience, at that moment, with other airline’s business class, but I thought it was nice how they had separate menus printed for each route & direction they fly. 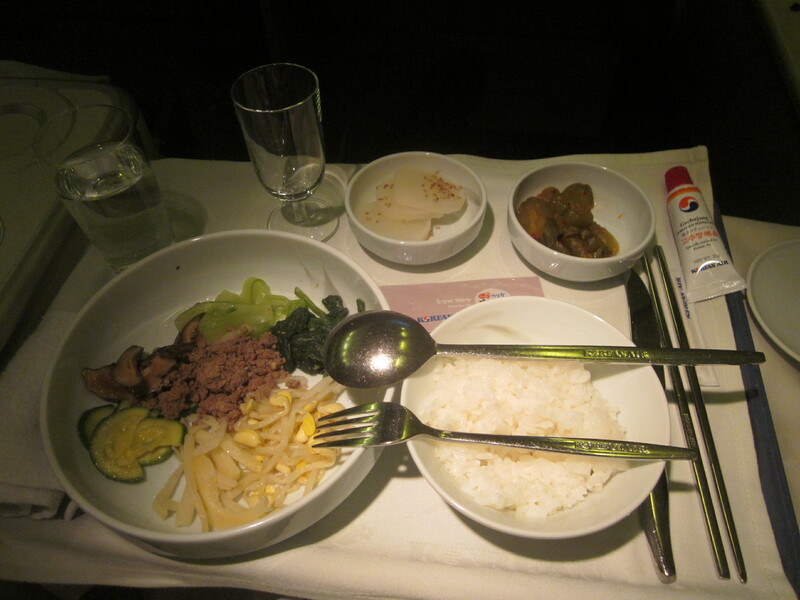 Meaning, there was a separate menu for JFK-ICN and ICN-JFK. I thought I took one with me to reference what meal options were available, but I may have left it on the plane. 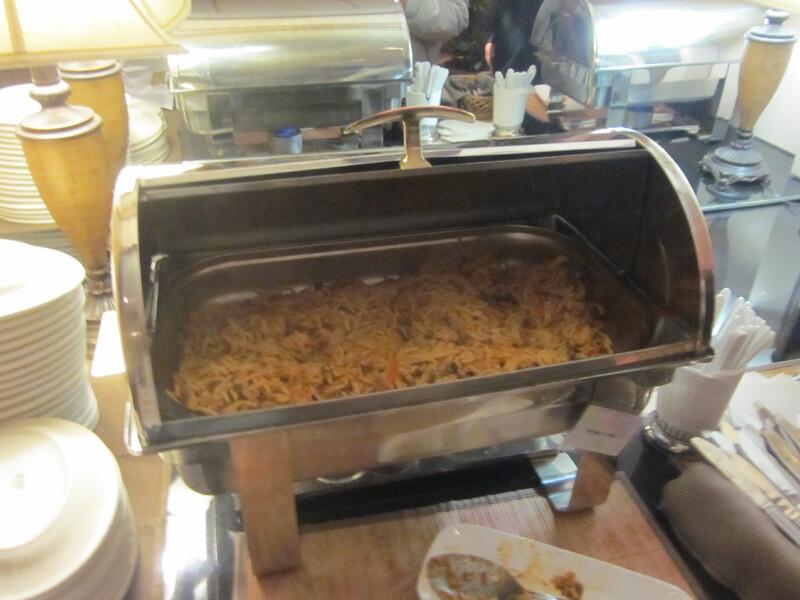 For my main course, I had the Bibimbap. Bibimbap with minced beef and seasonal veggies, accompanied by sesame oil and 'Gochujang' (Korean hot pepper paste). Sans wine and soup. Bibimbap mixed and all ready to eat with my wine and soup. Pre-arrival breakfast: Almond pastry, quiche with broccoli and roasted potatoes. Yogurt and fresh OJ. 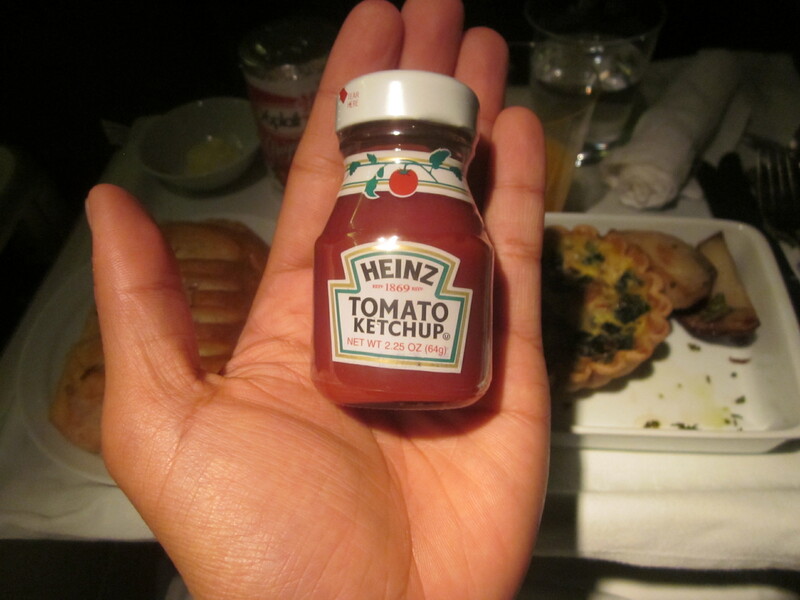 The cutest little ketchup bottle. The service is spectacular, though I think there is a little discrimination. Sometime midflight, between the main meals, the stewardesses were walking around handing out bottles of water, but they also had this little aerosol spray bottle they were handing out. I know the guy I was sitting next to was Korean, and did get one. But for some reason, I didn’t get one. 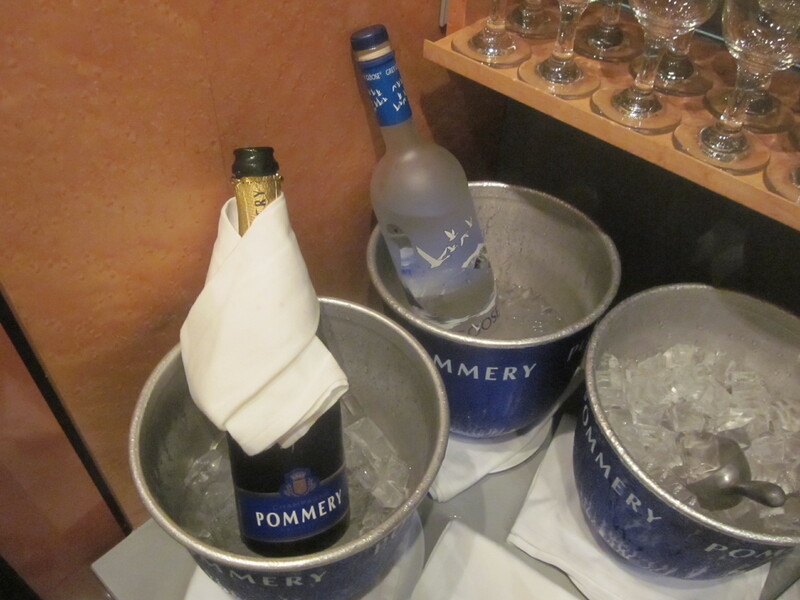 Sometime later when I got up to walk around, the galley had water, snacks, and these little spray bottles available. They’re just water sprayers for your face to freshen up a little bit. Why didn’t I get one? 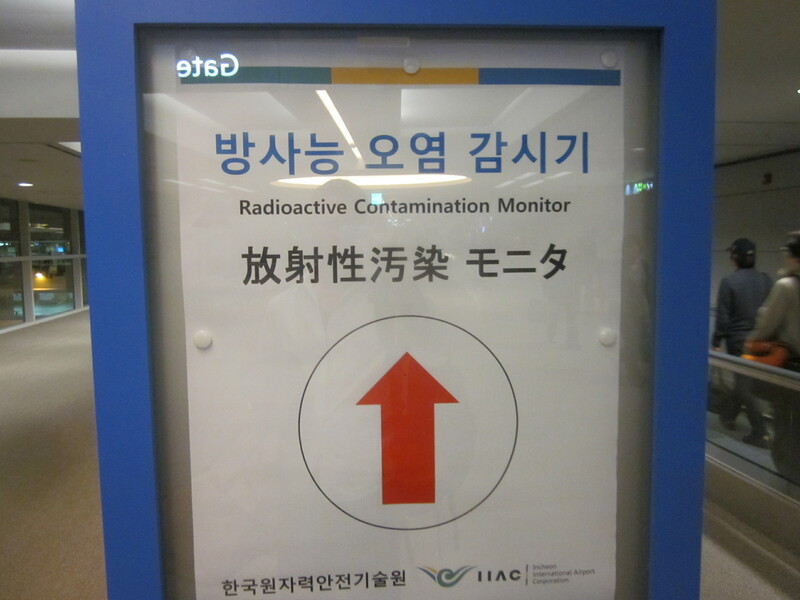 Do they just assume that only Koreans use this? Was it because I was on an award ticket and not a revenue ticket that I didn’t get one? If anybody has any experience with this happening to them, I would love to know your insight on this matter. 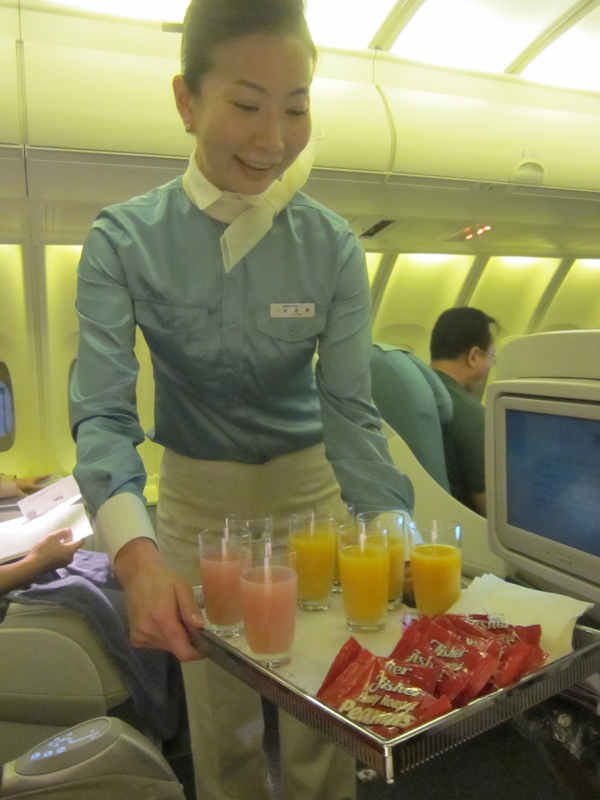 One little thing that I always appreciate is that the purser comes around to every First Class/Prestige passenger, addresses them by name, and thanks them for flying Korean Air. This happens twice on the flight…before takeoff, and before landing. We arrived pretty much on time. The walk from the plane to the transit security was pretty far, even using the moving walkways. 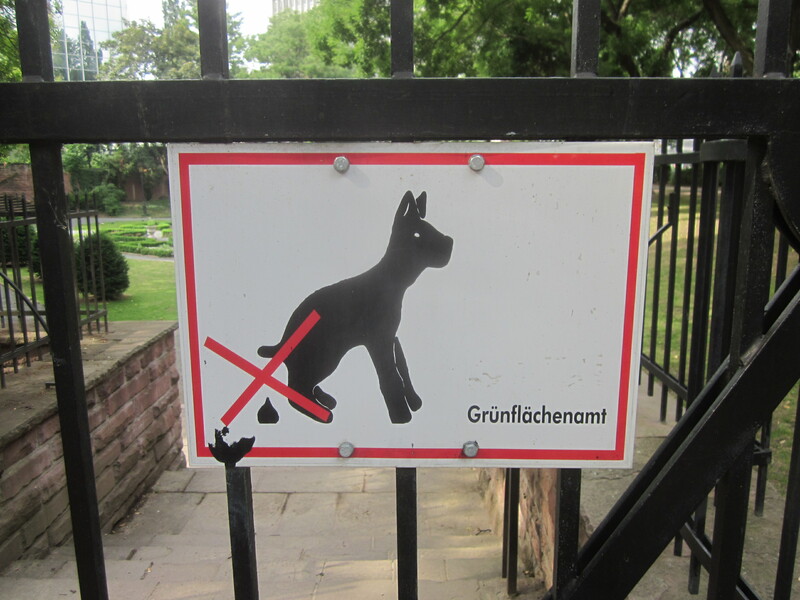 I did pass a sign I don’t see everyday on my way. Though it obviously makes sense from all the things going on at the Fukushima plant in Japan since that incident was only about a month prior. If you are a transiting passenger, security can take awhile, so try and use the bathroom when the plane is on approach to land as opposed to right after you get off the plane. There are only 2 or 3 x-ray machines and you can easily wait 20-30 minutes if you are last to get in line. Lucky for me, the Prestige lounge was open when I got there (4:00am), though on the website it wasn’t supposed to open for a few more hours. I’ll talk about the lounge in a separate post. The experience as a whole was great, but there are a few points that were unfavorable. The thing that sticks out the most was the intense cabin temperature. For some reason, Koreans like the cabin temperature to be borderline HOT. It was almost hot enough that I would have sat there shirtless. I removed everything but my sleeveless undershirt. AND they don’t have those personal air vents. I guess it didn’t help that I was upstairs either. Those little water sprayers helped cool down a bit, too bad I wasn’t initially offered one. I know I would be miserable if I were doing this flight in economy. So many people so close to me, with the temperature what it was, for 14 hours….I would be hating life. Despite these negatives, the service on the ground and in the air well make up for these shortcomings. 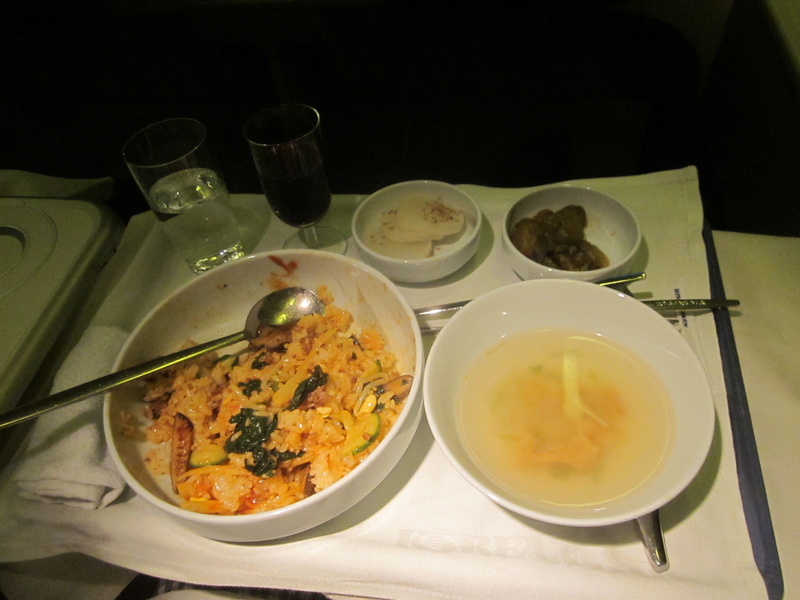 If I have the choice, I will still choose to fly Korean Air over Delta on these long haul flights. I borrowed this flight report format from “olafman” of FlyerTalk. He’s currently taking a year off with his husband to take his son around the world, staying in a new location every month. Read his story and flight reports here. 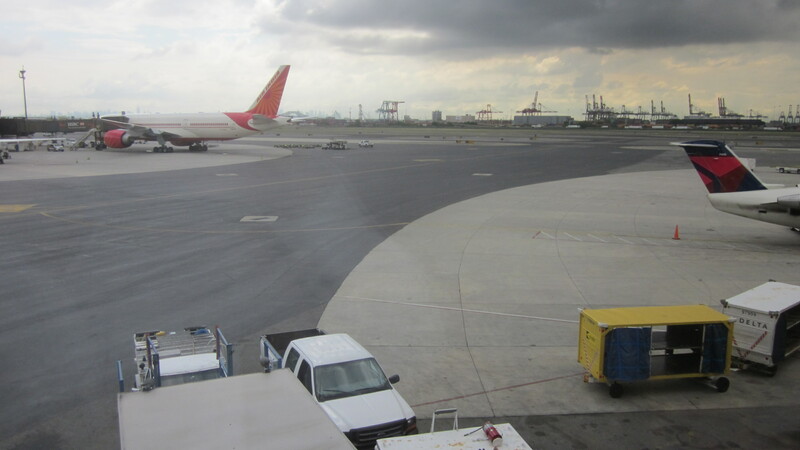 I had a difficult time finding a ride available to get to Newark Liberty International Airport (EWR). (My plan was to get dropped off at EWR then take a bus/shuttle direct to JFK.) My mom was getting home from work soon, so she said she’ll just take me all the way to JFK (though I drove the way there). Did you know that from Central Jersey, without traffic, you can get to JFK in about 45 minutes?? I thought that was a crazy good time. I was prepared for 2 hours. Unexpected good news……more time to lounge surf, the theme of this post. 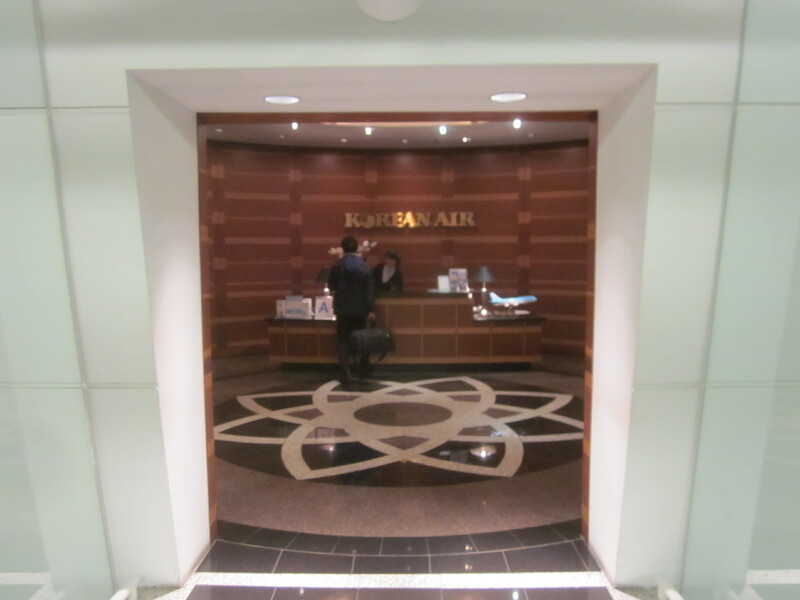 Since my Korean Air flight departs from Terminal 1, AND I will have extra time to visit (for the first time) non-Delta branded airline lounge, I will be able to visit and give you a brief rundown of the two lounges in Terminal 1 (Air France & Korean Air) and KLM’s “The Oasis” in Terminal 4. 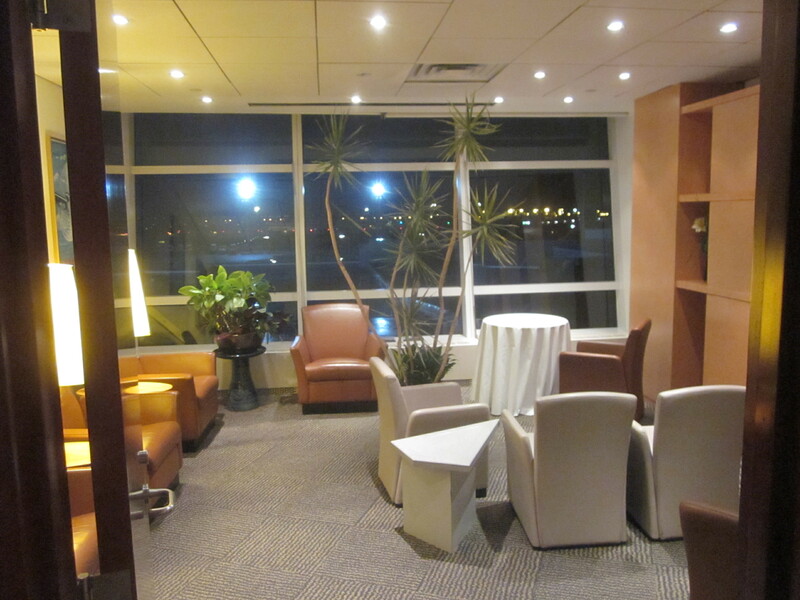 Luckily, that lounge is before security (landside) so I don’t have to deal with any fuss of not flying out from there. I dropped off my bags and got my boarding passes. 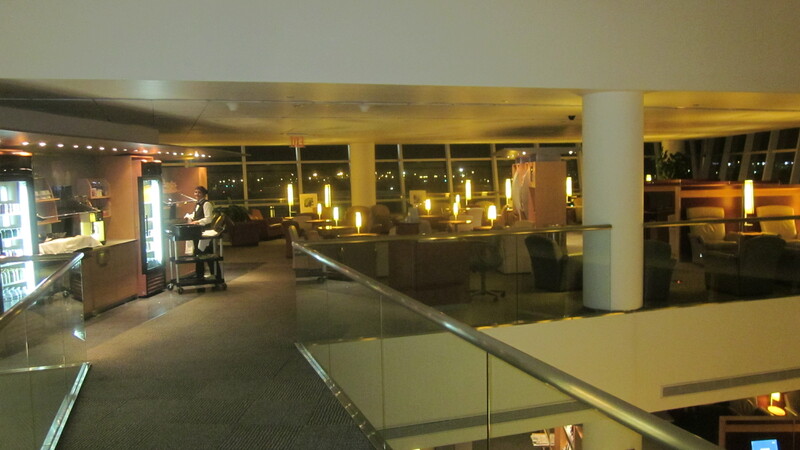 This lounge is located on the 2nd floor of the main concourse in Terminal 4, though when walking from the check-in area you enter the concourse on the 2nd floor. When I tried to enter, I was initially met with some resistance. 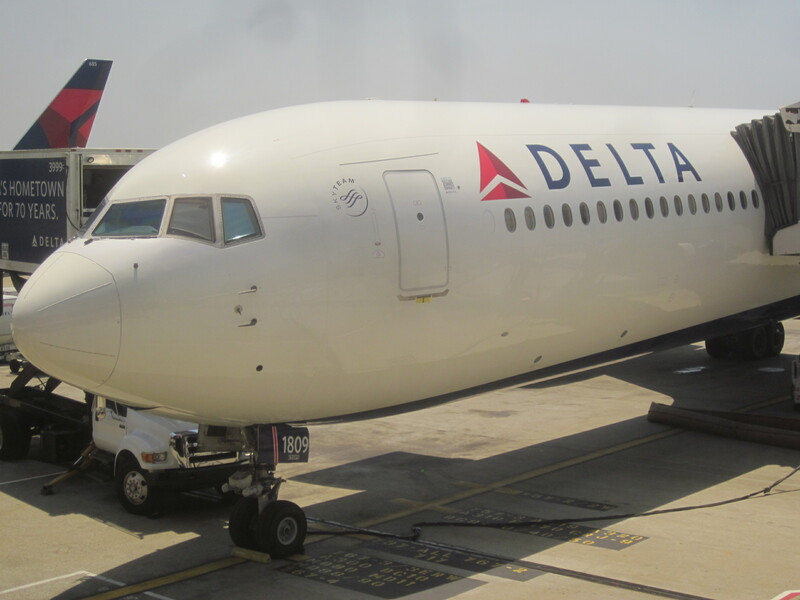 Starting March 1, 2011 Delta changed its benefits for Gold Medallions to align more with the rest of the industry. Golds will now be considered SkyTeam Elite Plus, which means that if the Gold Medallion is traveling on any Sky Team airline in ANY class, they will be allowed access to ANY airport lounge run by a SkyTeam airline. But Delta seems to have implemented this benefit without really telling any of the other airlines. The lounge check-in girl said that only Delta Platinum and Diamond members were allowed. I had to direct her to Delta.com and navigate a few clicks to show her that Gold Medallions were now SkyTeam Elite Plus. Just a quick road block but I made it in. Taken from left most side of the lounge, if you are facing the windows. 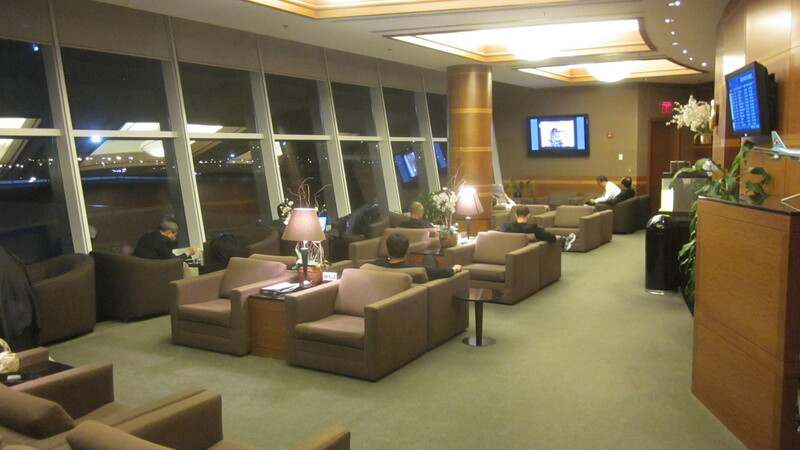 The lounge is laid out length-wise with one side being a floor to ceiling window with a view of Terminal 4 tarmac between the two “football field goal” gates. Here is a JFK airport map; it should make more sense. It was getting late at night so there wasn’t much traffic activity, but I imagine during the day or heavy traffic times the sights of all the big airplanes are spectacular. 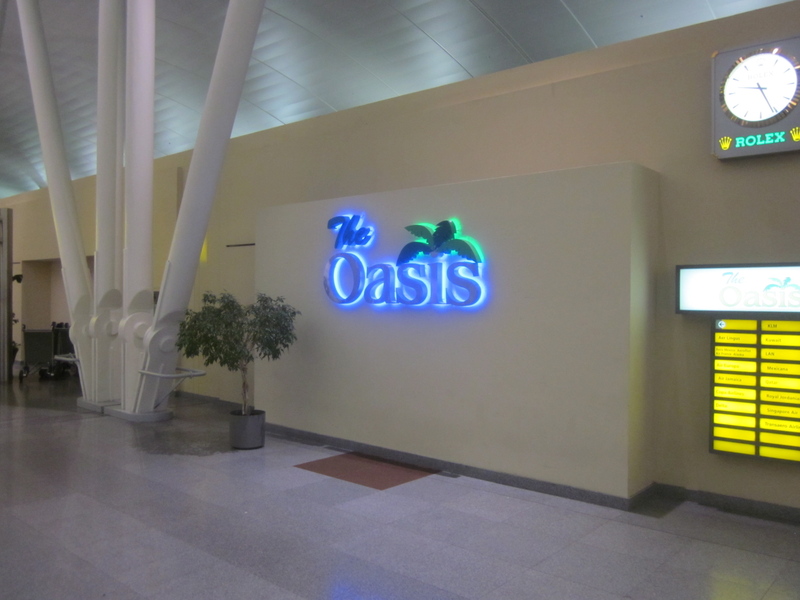 The Oasis has a very homely feel in its decor and furnishings. One of the neatest features of this lounge was their “living room” area. The dining table was sweet. I set up camp on a corner of the table. But its definitely a cool place to relax, with the couches that surround a fireplace at the end and bookshelves with books to read. 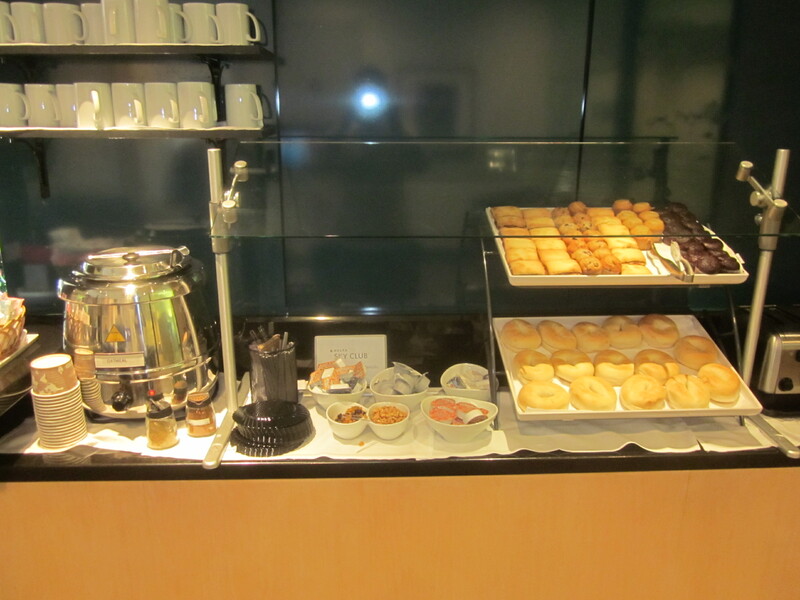 Another thing that is much better about non-Delta lounges (with the exception of the Delta Tokyo lounges) is the selection of food, especially hot food. Vodka sauce is my absolute favorite. And what man doesn’t like potatoes? Too bad the combination of the two does not make an ultimate dish. They were actually kinda bad. I almost wanted to not finish them and throw them away. But again, I hate wasting food. The chicken lo mein was good. It had a certain flavor I couldn’t quite place but it tasted of Indian origin rather than Chinese. An interesting flavor. Beer available were Red Stripe, Miller Lite, Heineken, and Kingfisher. Kinda a weird mix, but whatever. One positive that many Delta lounges have draft beer, whereas these were all cans. But as I found out over the next few weeks, cans are the norm. I tried for several minutes to connect to their wifi, but it wouldn’t connect. Oh well. After tasting all the hot food choices, and having a Red Stripe and a glass of Glen Ellen cabernet, I gave up trying to connect and decided it was time to move on to the Air France Salon. By now it is about 10:30pm. 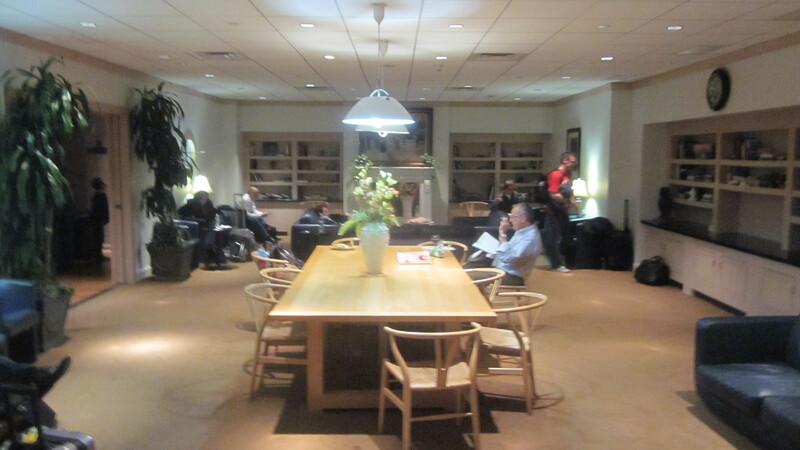 The last Air France flight takes off a little after 11pm; therefore the lounge closes around 11pm. So I only got to enjoy this gem of a lounge for about 30 minutes or so. It is located next to Gate 1 and the end of the terminal. Quite a big space. Two floors, with identical food/beverage spreads on each floor. As soon as I was allowed entry, I started taking pictures, telling the attendants that it was for my blog. This is Alex, one of the Salon attendants. He was quite helpful. After they requested all the patrons to exit at 11pm, he came up to me and gave me some more information about the lounge. Apparently there will be a complete lounge overhaul. Remodel so that First Class lounge is upstairs, Business Class is downstairs. I don’t remember many more of the specifics of what the difference will be between the floors. But I know Alex has been waiting anxiously for this post, so he can comment on the future differences. Thanks Alex! The 2nd floor has a few private rooms good for about 8 people. Unfortunately, the views out of most of the windows is not as pretty as The Oasis. The lounge takes up a corner of the building, and one side overlooks the roadway, not the tarmac. The other window wall, mostly when looking out from the 2nd floor, has a roof outstretching from the building so that also detracts from the view. 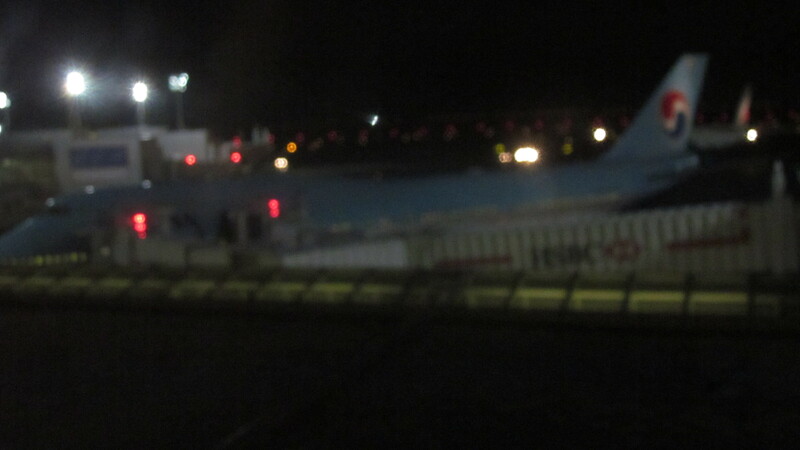 However, you can still get a decent view of the plane sitting at the gate, and a small section of a runway. 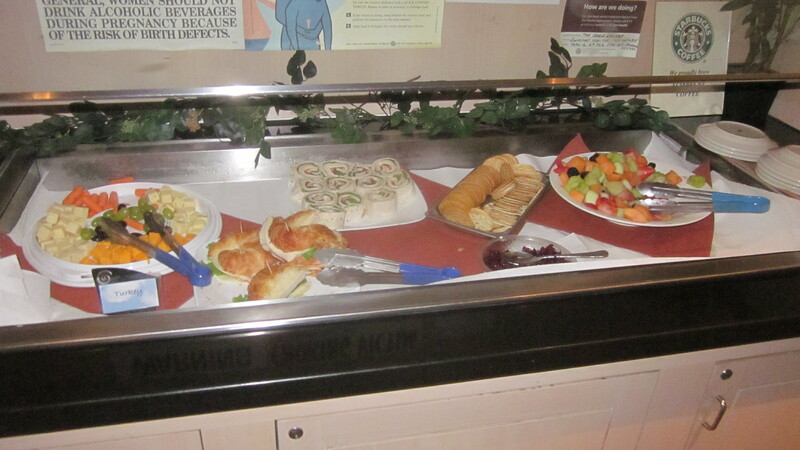 The best part of the Salon was their food and drink! Alex finishes the tour, takes down this site’s address, and I’m on my way to the last stop of this tour. 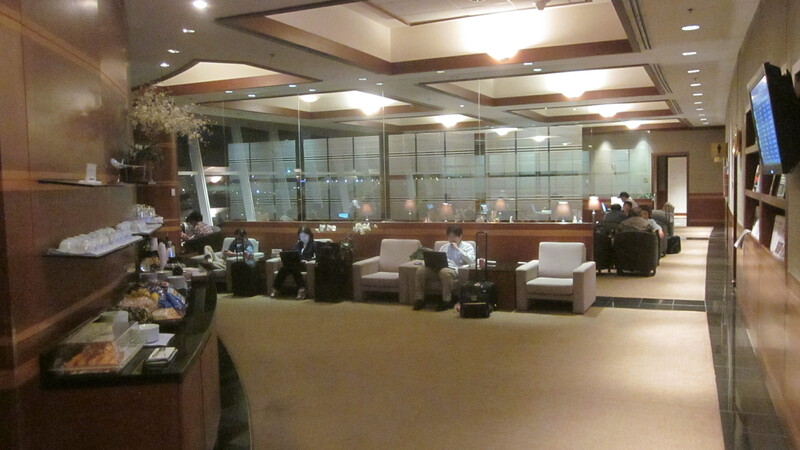 Right down the terminal from the Air France Salon, about 30 yards away on the left, is the Korean Air lounge. Its on the 2nd floor, and has a cool white tunnel you walk through before you enter the lounge. 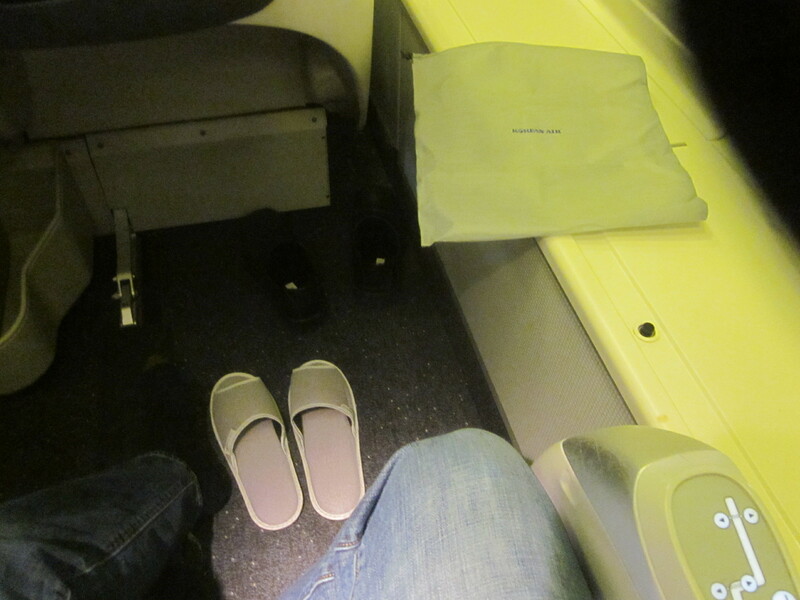 To the left is the First Class section, to the right is the Prestige (business class) section. Before I stake my area in the First Class side, I go in to the Prestige section and scope it out. The Prestige side is pretty packed, with a not so great selection of food. Almost none. 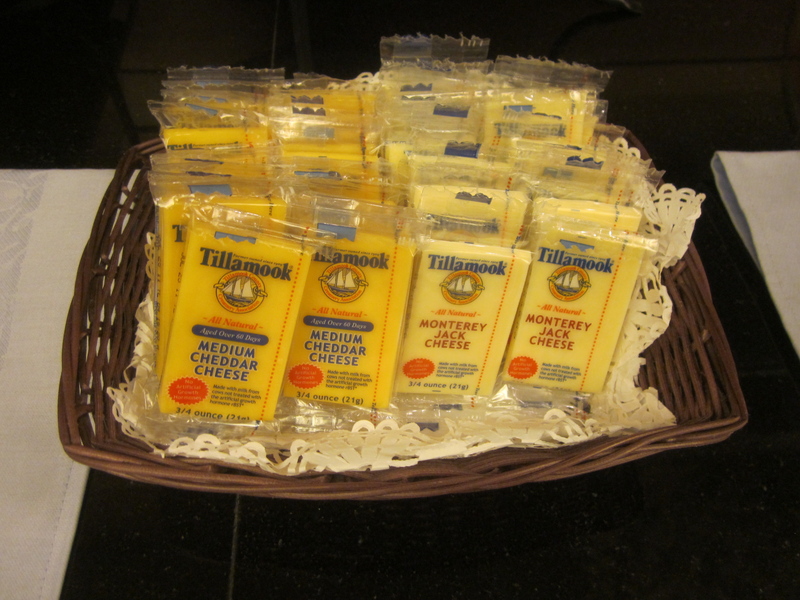 Pastries, chips, and the Tillamook REAL cheese that most of the Delta Sky Clubs have. (Cheese was a large topic of discussion on flyertalk.com last year) The Delta Sky Clubs are all mediocre at best, except for the Tokyo clubs, with the only redeeming factor being usually having decent beer selections at their hub airports. 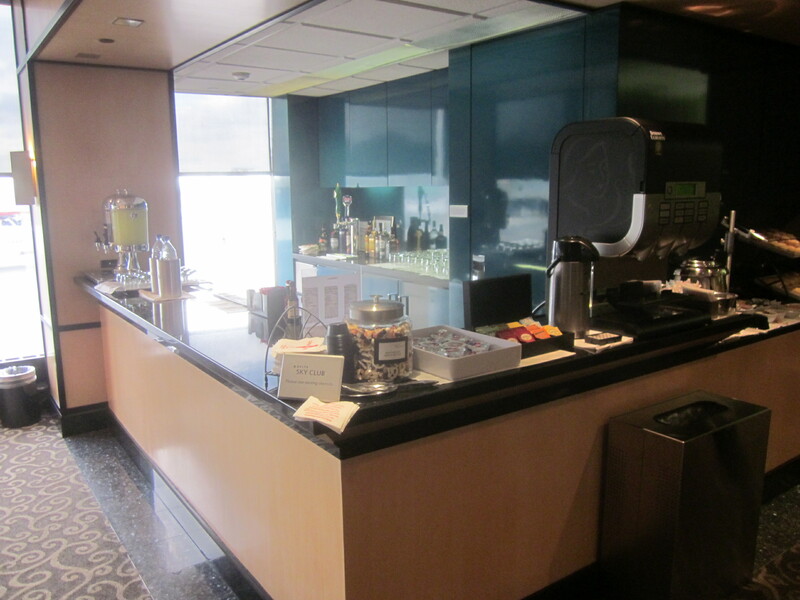 This lounge was barely a step up from a Sky Club. 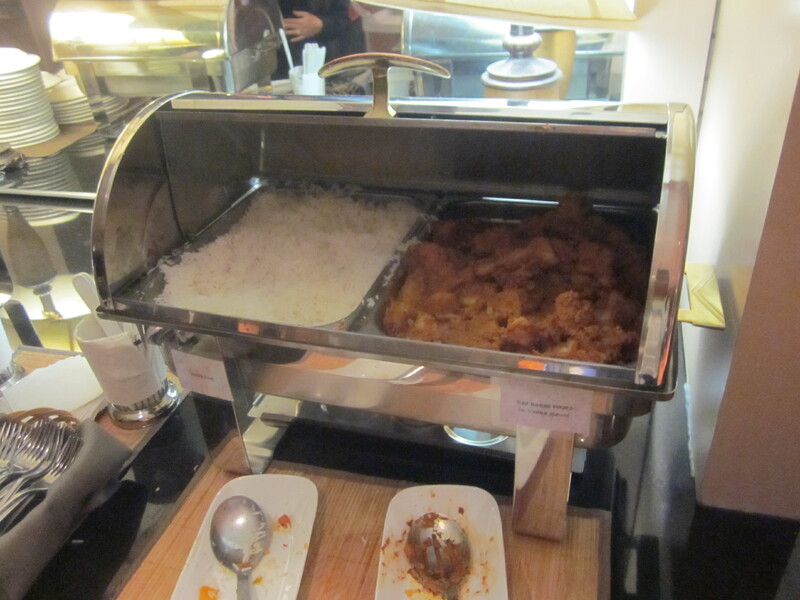 For an international lounge, from a very well respected airline, it was very disappointing. The selections were pretty much the same on both sides. Almost like the snack basket passed around in First Class on non-meal flights on Delta. 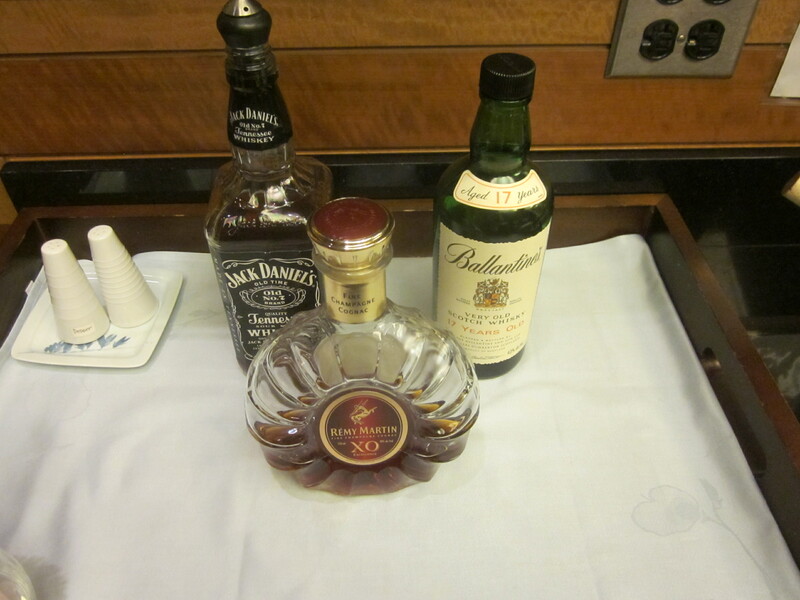 I enjoy some Korean OB beer and Remy Martin (at least they had snifters), then the time came to board. Oh. Also on the Prestige side, there were a couple rooms with massage chairs and a table. 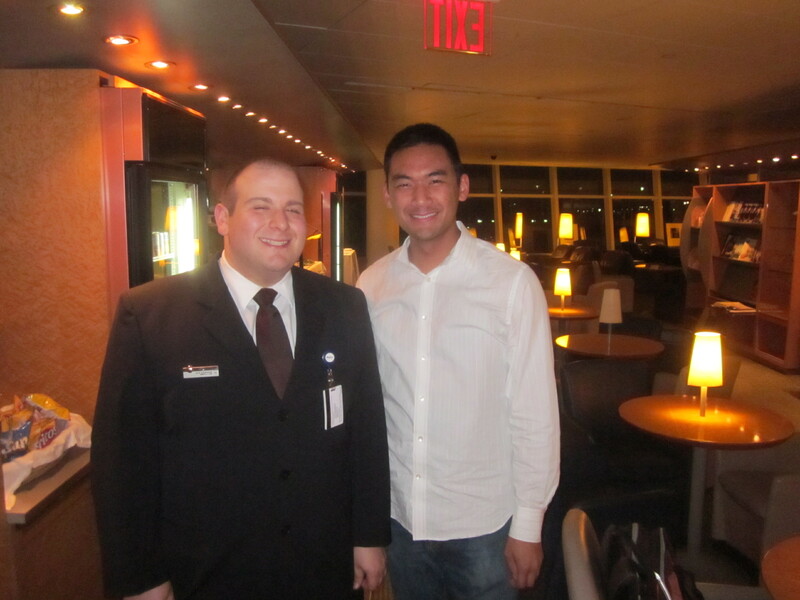 Overall, I had a great experience using my Skyteam Elite Plus status to lounge surf for the first time. I only with my Priority Pass (free lounge benefit from my American Express Platinum card) came in the mail before I left. I could surf some other lounges as well. Perhaps next time. View from my window. Those turbine engines look REALLY big from here. 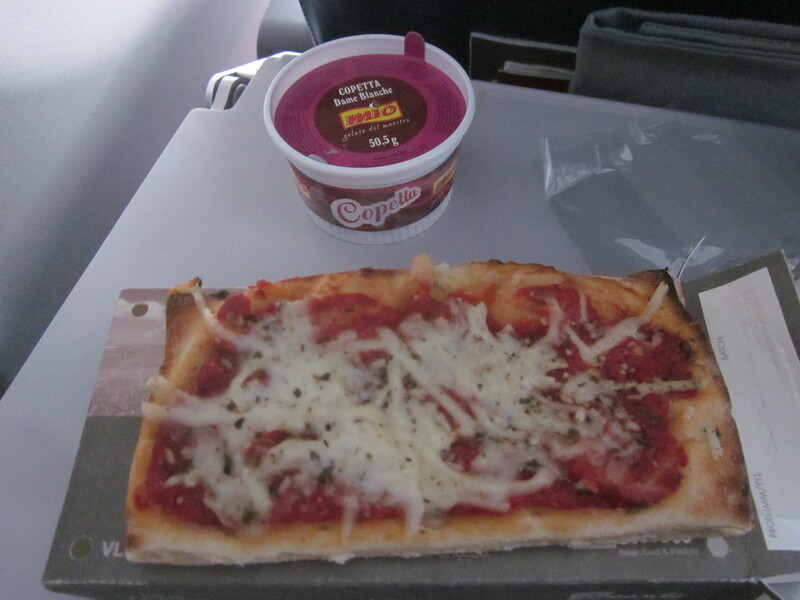 This was a fairly standard economy flight. There were individual TVs for each seat, but because I stayed up all night, I was using this flight as my time to sleep. So when I woke up at around 1pm in Boston, for my body, it would be like sleeping in late. Even though the other two slept, they were pretty tired too and we all pretty much slept the whole way. 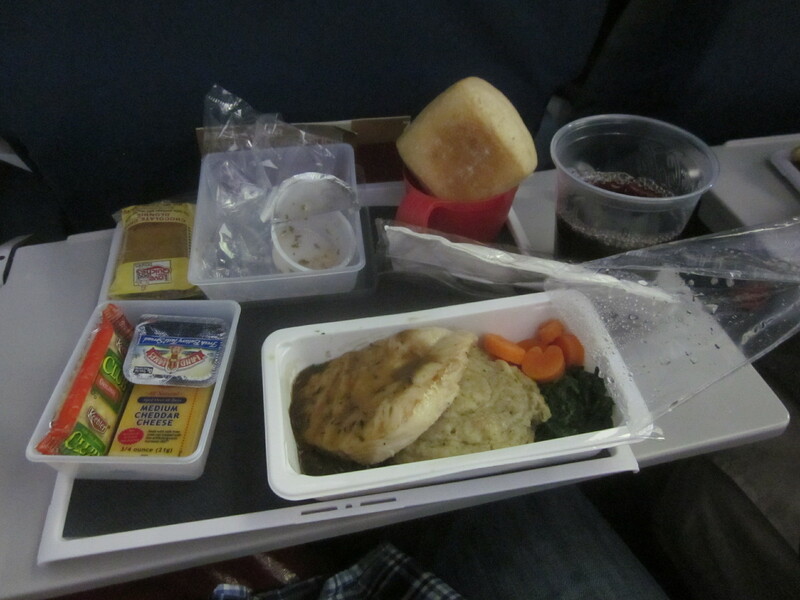 The main thing that I remember from this flight is the food service. I think it was lunch. I feel I’m a pretty adventurous eater. This entree was probably the most disgusting thing I’ve ever eaten. The vegetables were fine, but the sauce had this weird taste that made it difficult to put the food down. I was soooo hungry though that I did eat almost all of it. (If you’ve ever had a meal with me, I HATE wasting food. Even if its something I don’t like, I’ll still eat it. If you have some food left on your plate, I sometimes eat that too. I used to be a waiter, and it sucked throwing away almost full plates of food.) 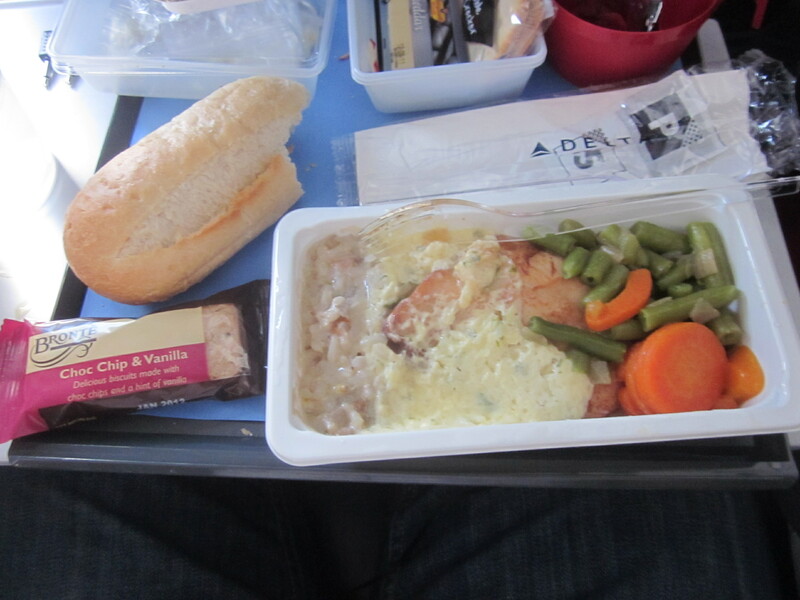 If you’re ever flying Delta trans-Atlantic, you may want to steer clear of this food choice. Take the other. Thankfully I was able to fall asleep again after eating that horrific meal. 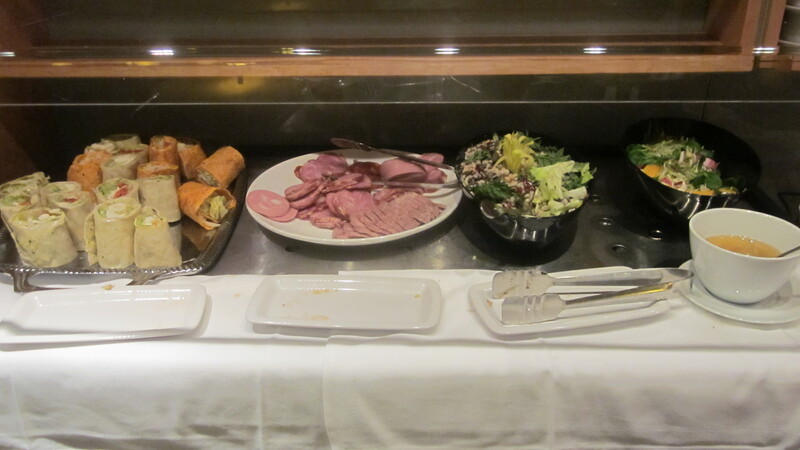 A few hours later, I was nudged awake to be served our pre-arrival snack. Of course, the pizza sucked. They were microwaved warm, so the crust was chewy. But after that awful chicken and rice, this was a 5-star meal. The plane arrives at the gate a 20 minutes late, but its alright. Our bus that takes us to New York leaves at 3:30pm. We get herded to immigration, and its here where I get to try out Global Entry. (One of the benefits of being an American Express Platinum card member. Read about that benefit in this post.) I go straight to the Global Entry kiosk, give my fingerprints, and voila I get my immigration & customs ticket. I don’t have to wait in line, no answering any questions, almost no interaction with any Border Patrol. 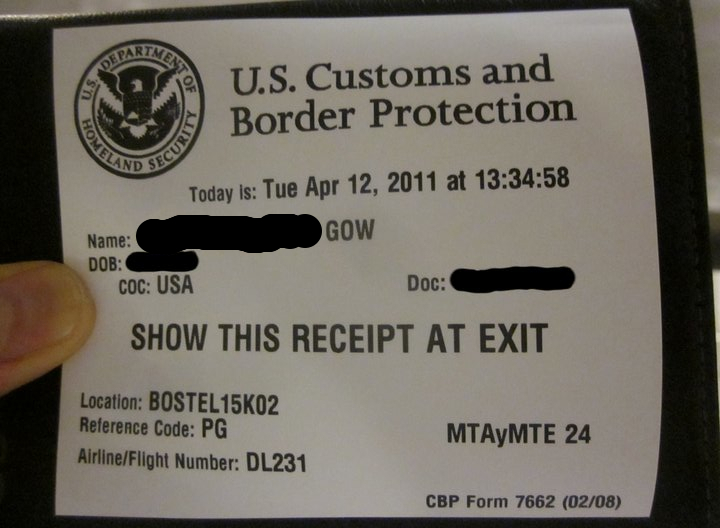 After I pick up my luggage, I just hand the customs agent this ticket, and I keep walking. If you don’t have to wait for your bag, you could off the plane and out of the airport in less than 15 minutes. For those that have never traveled internationally, as you exit the plane in a new country and are not connecting to another flight, you have nowhere to go but to immigration. After that, you pick up your luggage, then wait in line again for customs questioning. Global Entry is definitely worth its 5-year fee of $100. Even if I only flew internationally once a year, I would feel that $20 a trip could be worth it. Maybe not in Boston, but arriving into JFK or LAX you could easily wait 30-60 minutes for immigration. After a long haul flight, that’s the last thing I want to do (like we did in the Fast Track lane in LHR). Getting home from Boston, we used Bolt Bus. One way, its about $15, and takes 4 hours, more or less. The seats are all leather, there are plugs at every seat, and there is wifi onboard. Throughout the “flight” the wifi connection was pretty slow, but still better than nothing. Definitely one of the best options if traveling between the major cities in the Northeast. And its price is so much better than flying or Amtrak. Transferring to Boston South Station is a 15 minute commute on the Silver Line on the T, and only about $2. What I didn’t know was that the Silver Line is a bus, not a subway/metro. Well my attempt to stay awake for the rest of the day failed. Oh well. After I arrive home, I have about 24 hours before I leave for the airport again to start my 11-day portion in Asia! Like Get Gowing on Facebook! LIKE my Facebook Fanpage and get all my posts on your News Feed. Also check out all the pictures and videos that didn't make the cut to the blog. Free bus travel on Megabus!